Hiked a part of the Ice Age Trail that I had never been on before. 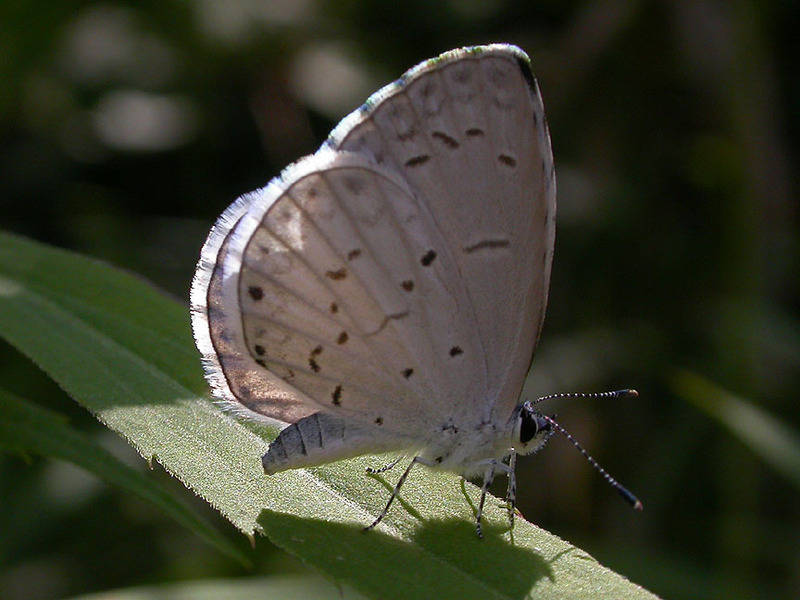 The Karner Blues are the first I have seen this year from the second generation in Waushara County. Location: My home in the town of Brooklyn. This includes the gravel trail by the boat landing. 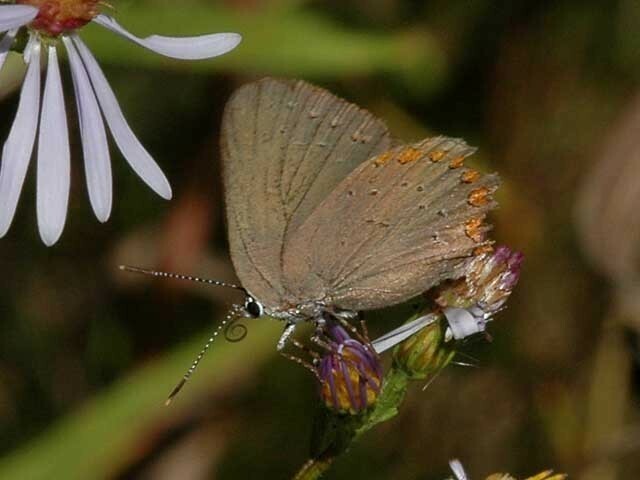 Edward's Hairstreak was a surprise and it wasnt' all that worn. 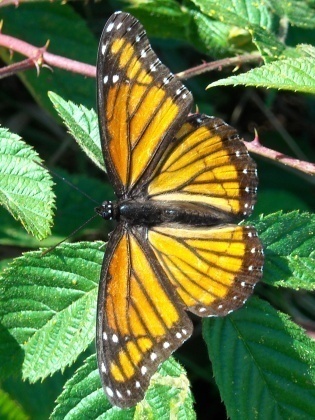 2 of the monarchs were near home, the rest of sightings were near Oregon where I have a garden plot. 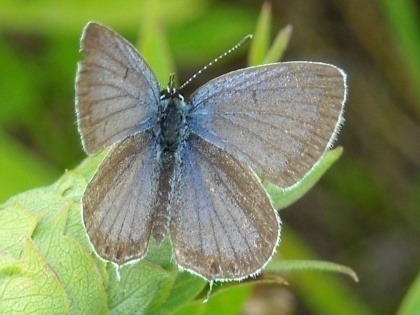 Not many individuals but 26 species overall. 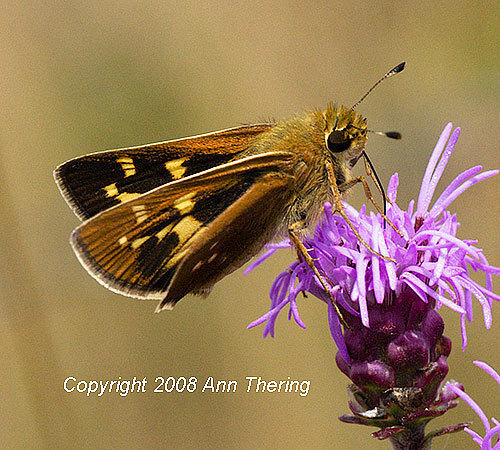 Highlight was my first-ever SILVER-SPOTTED SKIPPER here in far northern Wisconsin (alas, no photo). This poor thing looks like he has been through a lot..holes and tattered. It clouded up soon after I went out. 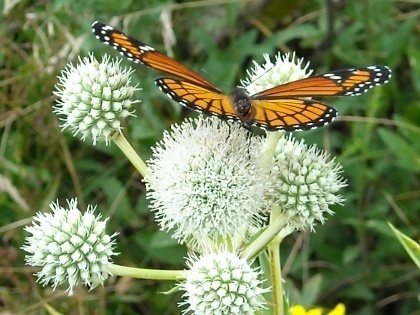 I believe that the Viceroy is the first butterfly that I've seen nectaring on Rattlesnake Master. 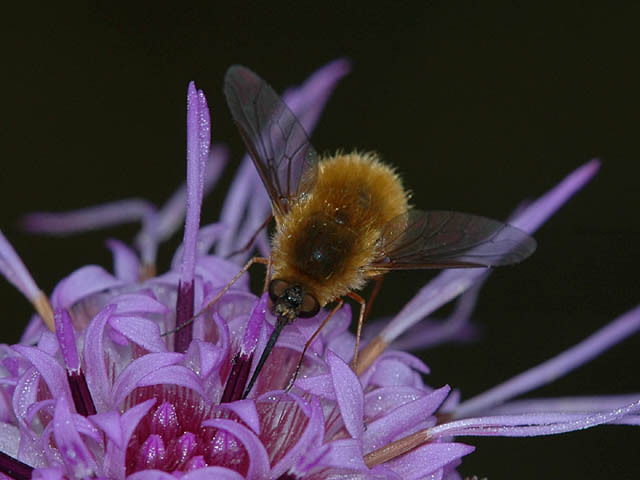 The Swamp Thistle are looking spectacular in the wet meadows between the woods and stream. 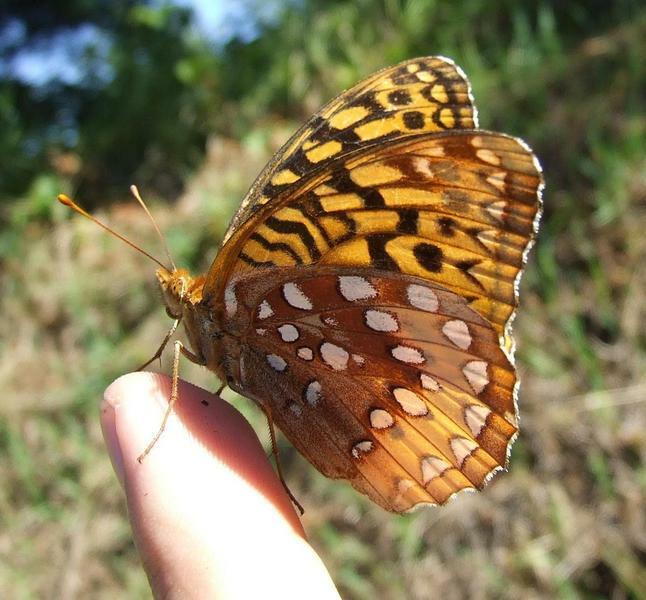 Poor numbers of butterflies on a two hour hike. 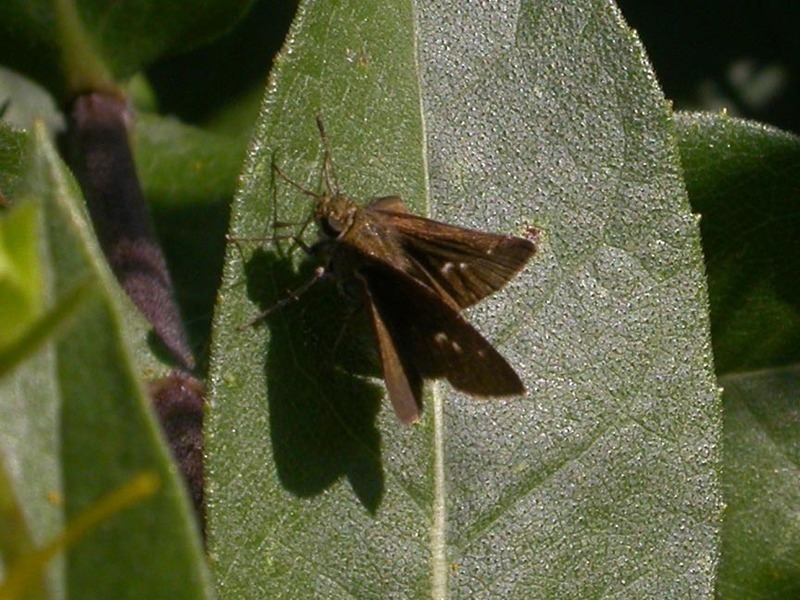 Otter seen by the creek, Haploa Moths still flying, found one Macaria oweni in the woods (new moth species for me). Started clouding up as I arrived, fair amount of wind. Only stayed 1/2 hour. 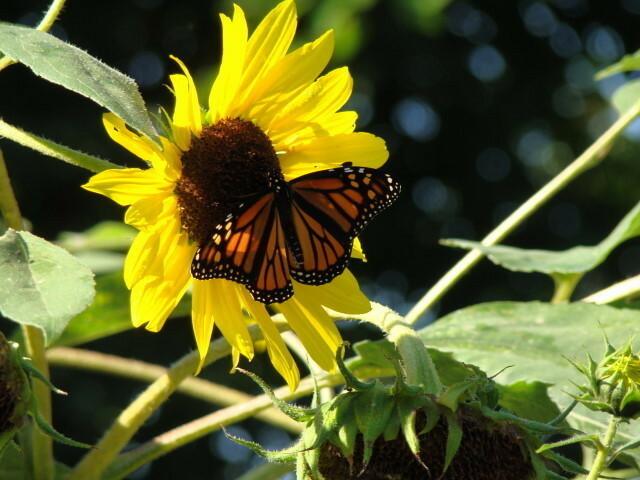 It was pretty windy and hard to get a picture of the Monarch because he was sitting on a butterfly bush flower and it was moving all over...he looked liked he didn't mind the ride. 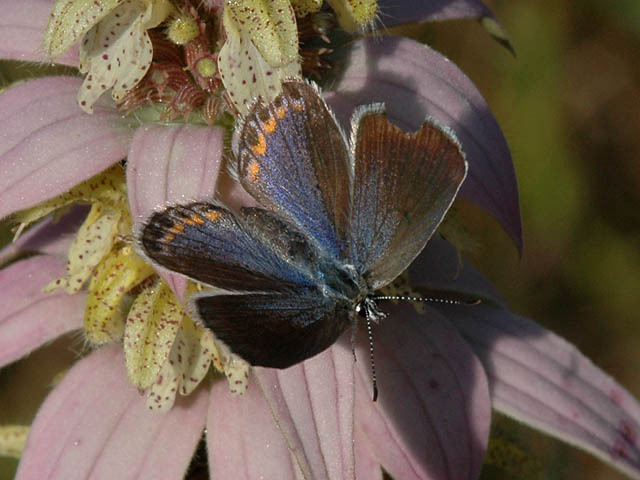 The Red-spotted Purple was here the day before in the front flower bed. 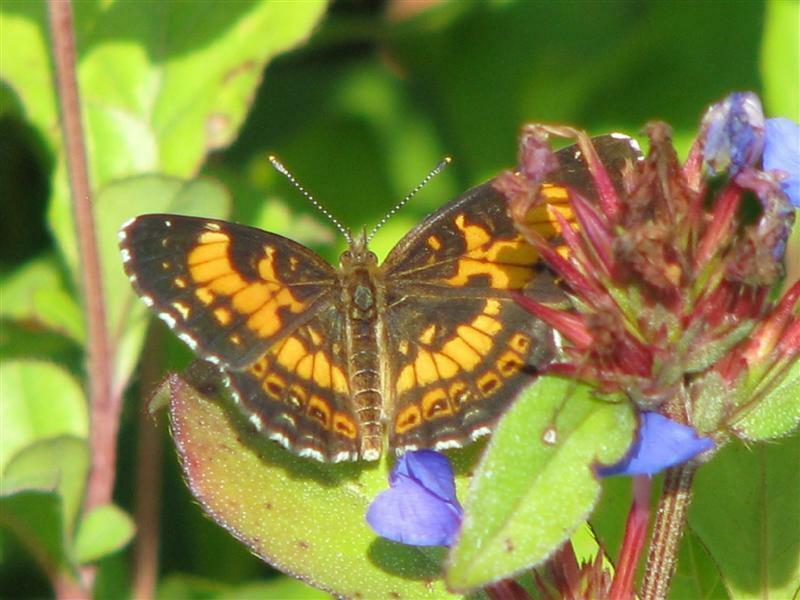 Red Admiral was perched on outside cover to air conditioner. 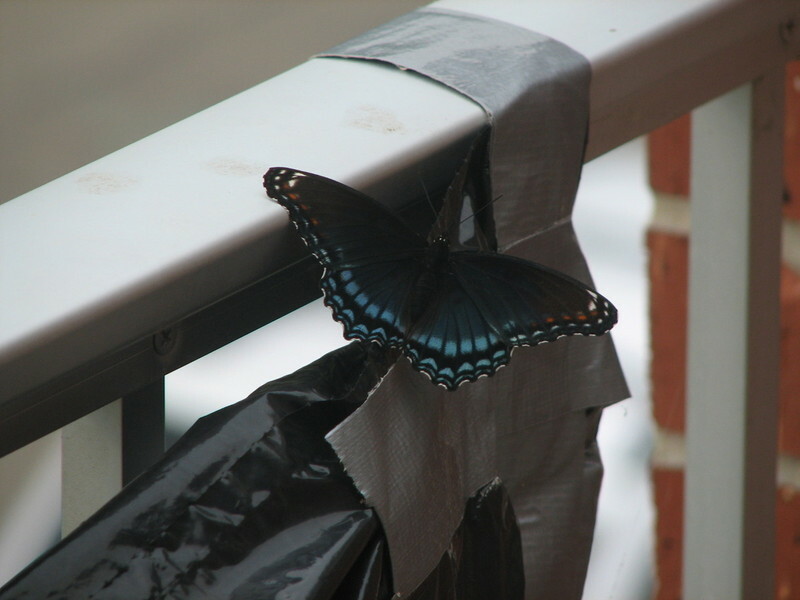 Red Spotted Purple was perched on a black plastic trash bad which covers a pair of rabbit ears tv antenna. Both sited inside of a one hour period, and a day when it had been extremely stormy, during a tornado watch. 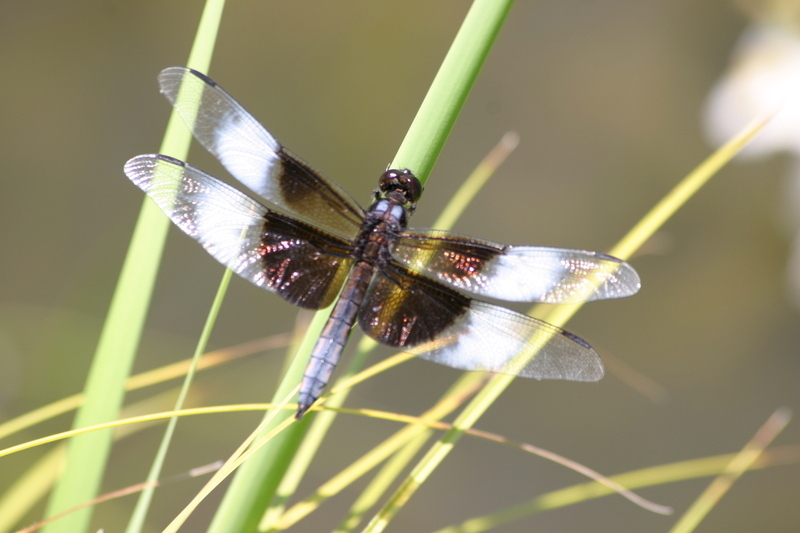 Also saw my first Great Spreadwing of the season. I had better success bird watching. I saw 7 to 9 sandhill cranes, 2 great blue herons, and a yellow headed blackbird. Too humid to stay out long. 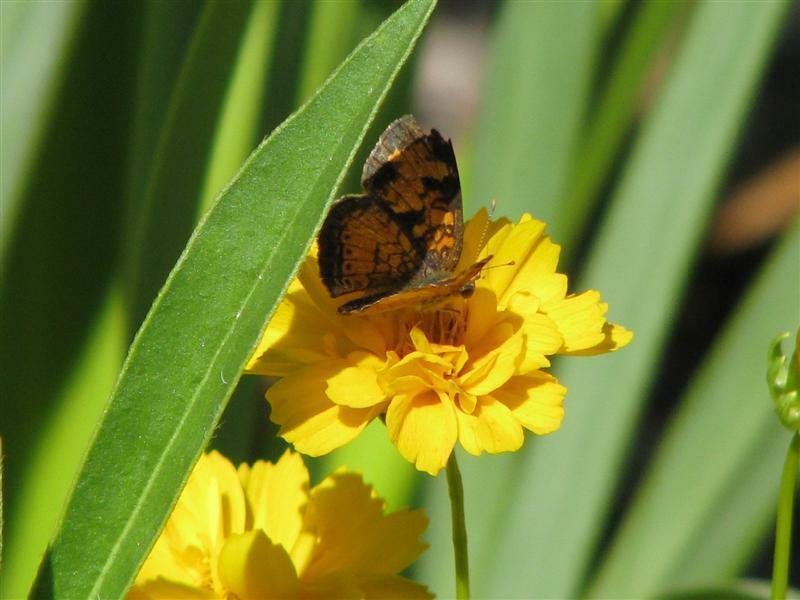 Small list despite the beautiful summer flowers. 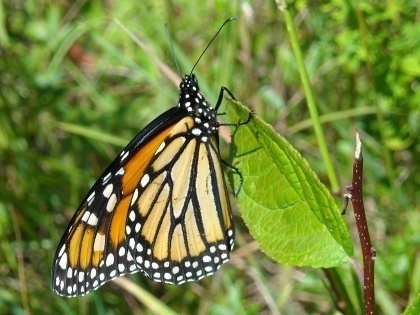 Everything but the Monarch was seen this evening in my Oregano patch. 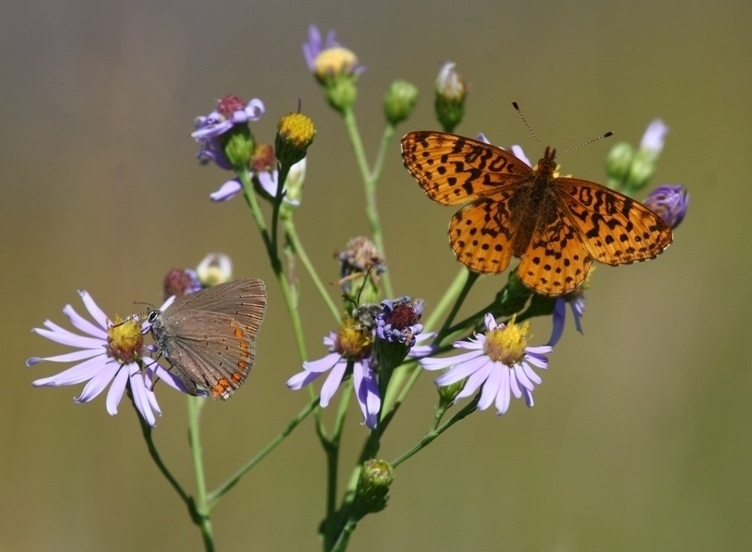 There are thistles and blazing stars blossoming nearby, but they are practically ignored by the butterflies. 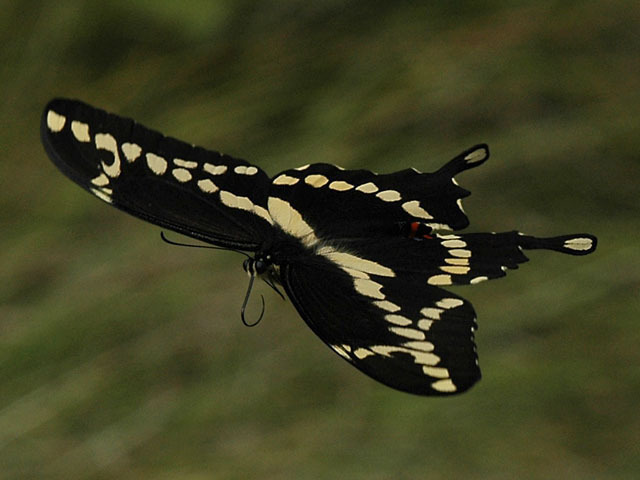 One of the Giant Swallowtails was found dead on Hwy. 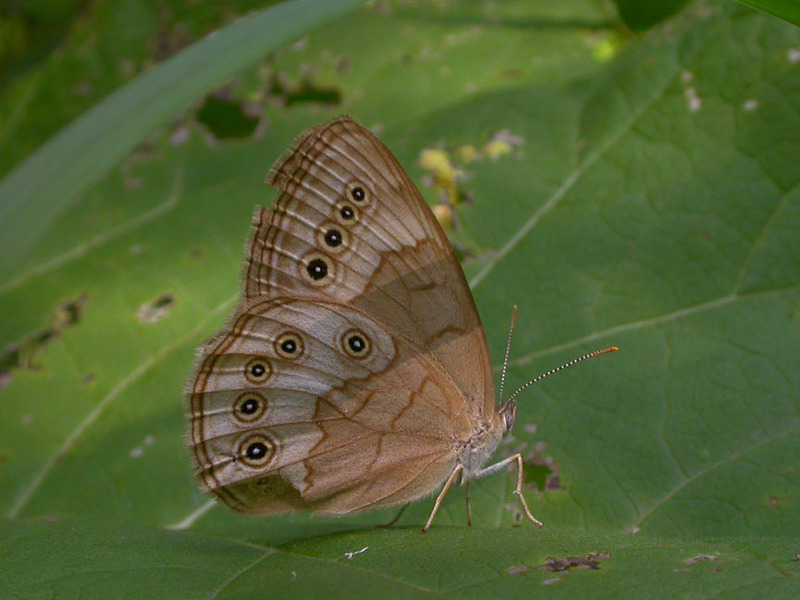 D., and one of the Red-spotted Purples appeared to be a hybrid -- with a white bar across each forewing. 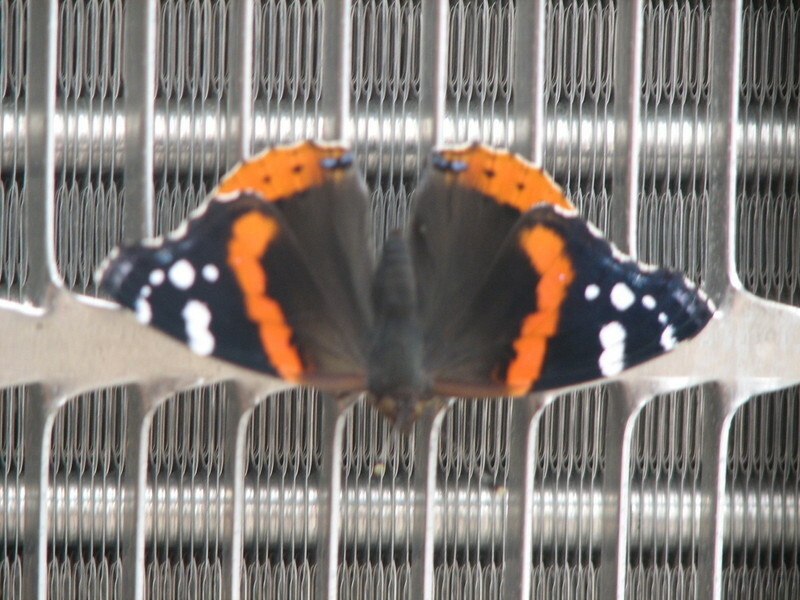 After last year's Red Admiral abundance it seems strange that my best butterfly today was a Red Admiral. 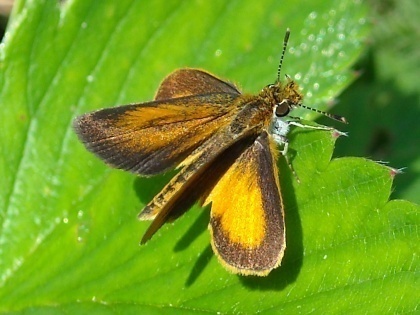 Most were sighted at Vermont Lutheran Church cemetery, but the orange sulphur was seen in Black Earth. 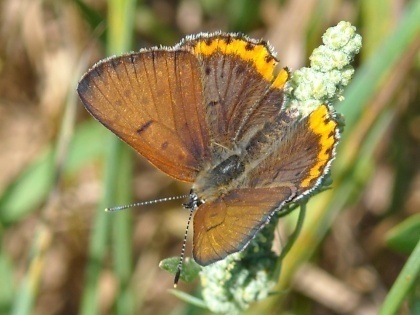 Most of the coppers were quite worn. Also had a nice Dragonhunter. 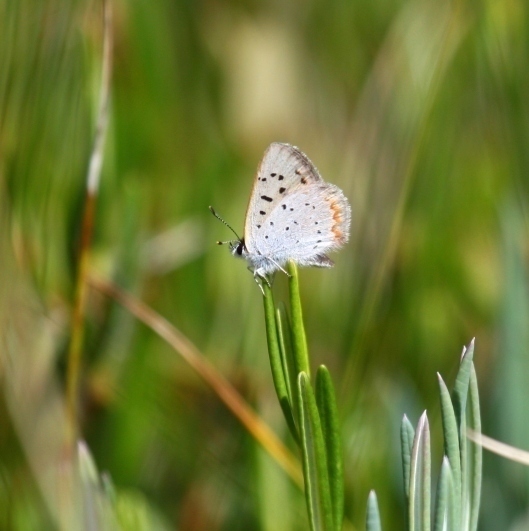 Rained several times but had a couple of hours between the drops to see a few things. 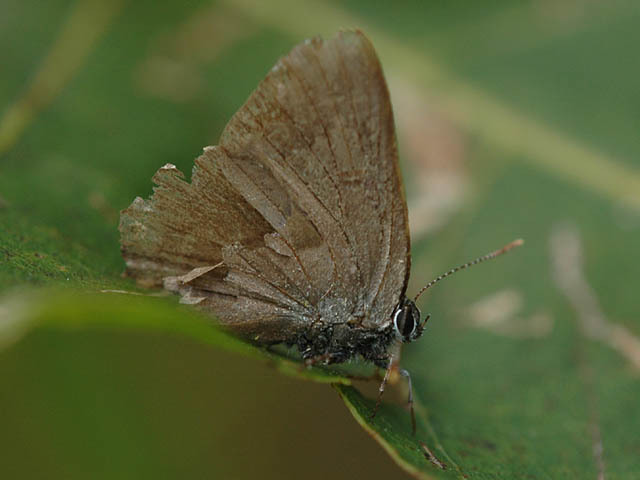 Attached is an additional hairstreak that was so worn that it was unidentifiable, but it still flew away! 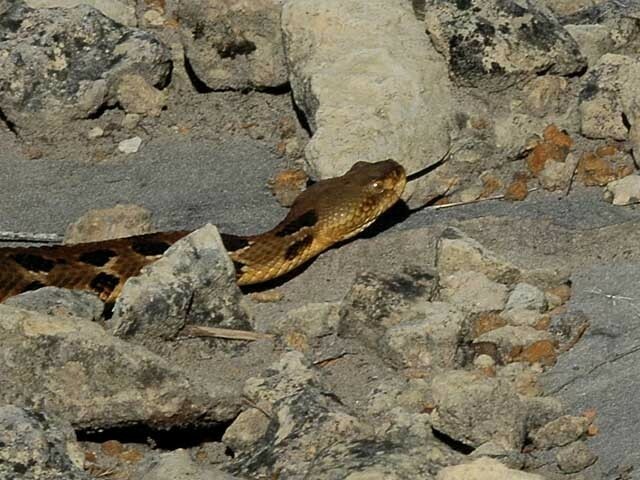 I finally made it to the Baxter Lane area to see the rattlesnakes that Todd Sima saw there on June 28, 2007. Also spotted indigo buntings, 1 male, 2 females. 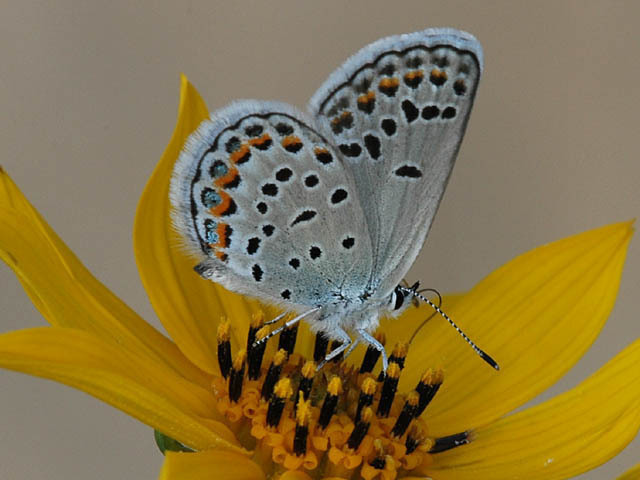 Only the male is the vivid blue. 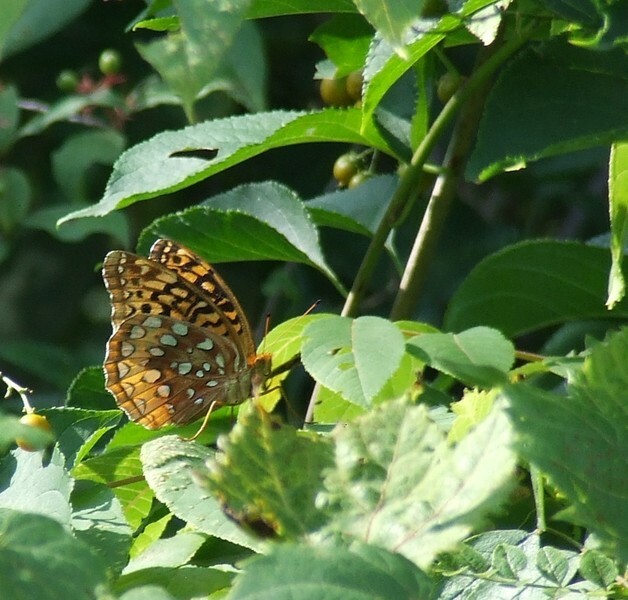 It's my son's wedding day, so I only had about 10 minutes to spend on butterfly watching. 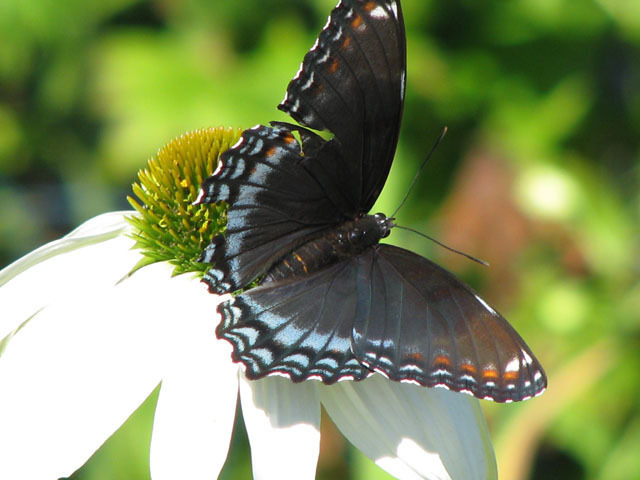 Most of the butterflies that I find in my flower gardens enjoy the purple coneflowers. 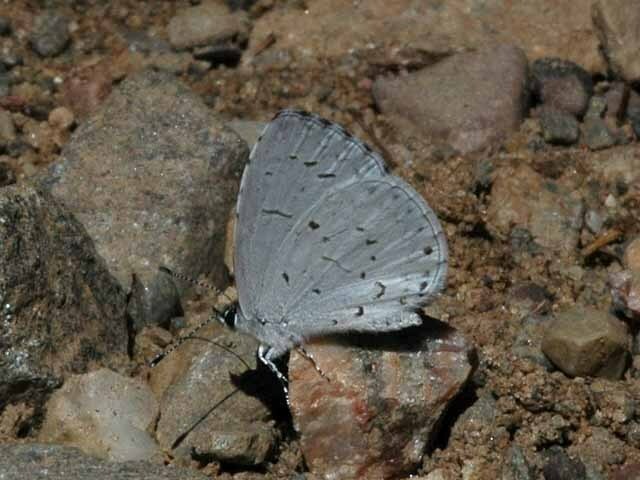 We stopped at three areas in Avoca and also the Blue River Sand Barrens SNA where we did see an American Lady. Mostly sunny but barely in 70's and north winds ~15 mph. 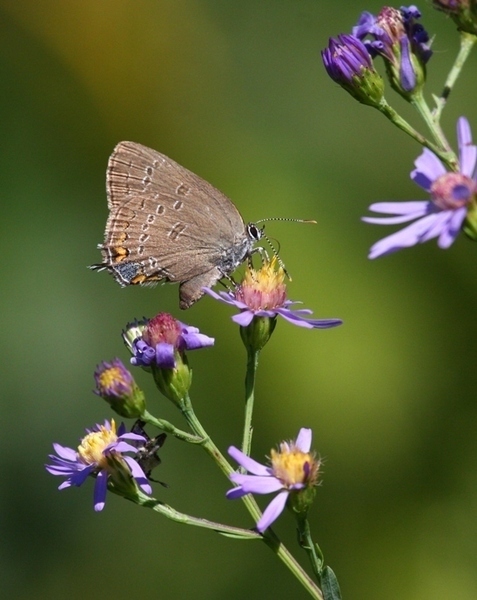 Lots of nectar sources but fewer butterflies than last weekend. 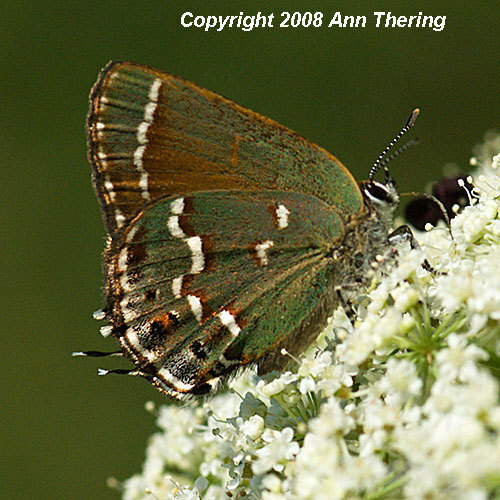 Elderberry Longhorn flying in the wet meadow was a highlight of the morning. Location: Buzz Besadny Fishery Kewaunee,wi. 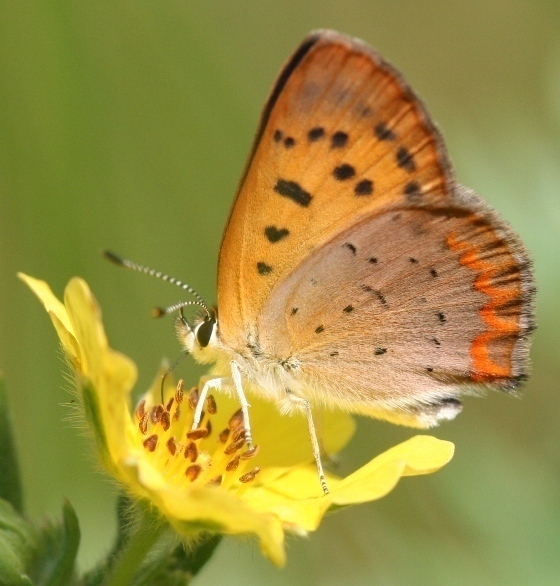 This open sunny meadow has many beautiful native prairie flowers but is heavily infested in the center with clovers and alfalfa, which accounts for the large number of Orange Sulphurs. 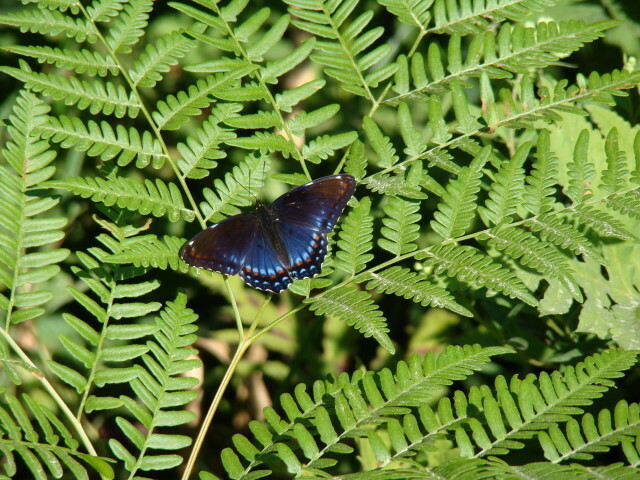 The Red-spotted Purple had partial white stripes on its forewings. 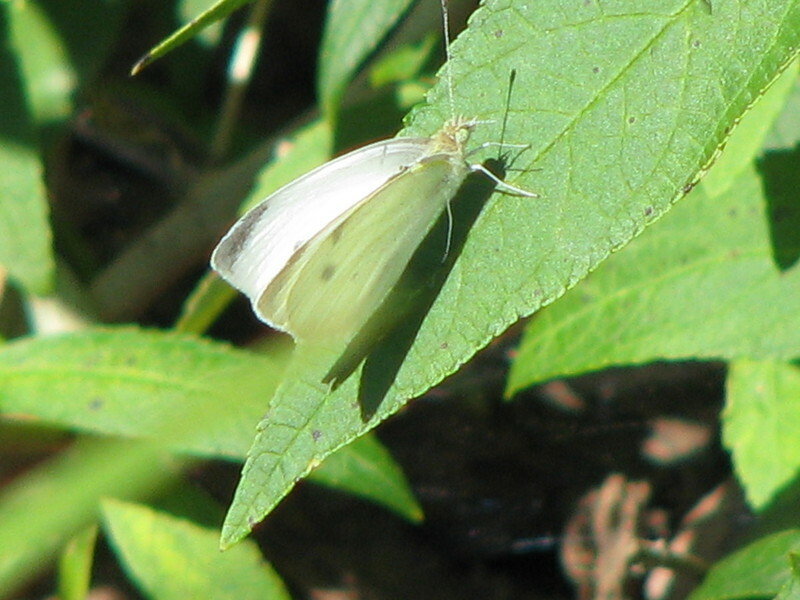 Cabbage Whites were everywhere. 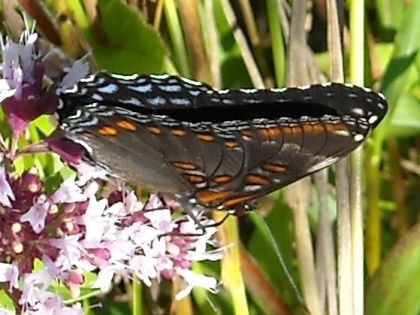 Besides the butterflies, I also saw a Snowberry Clearwing moth feeding from a Swamp Milkweed. 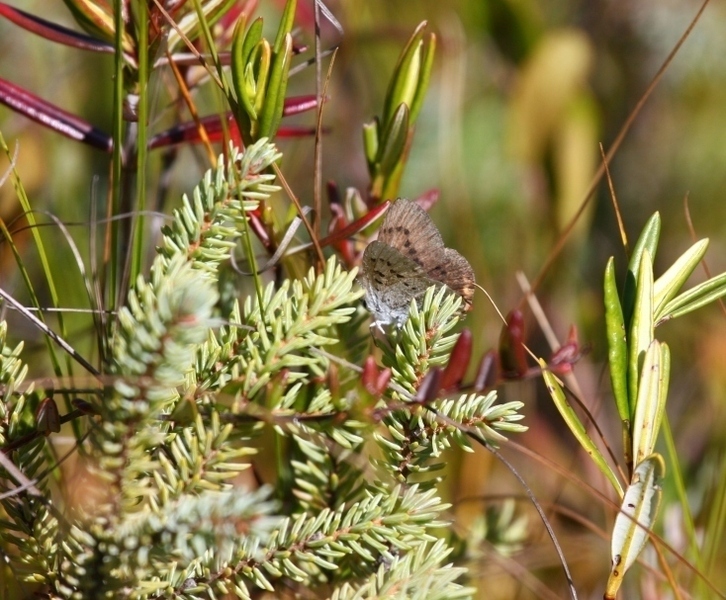 I spent well over an hour walking around and only saw this one butterfly. 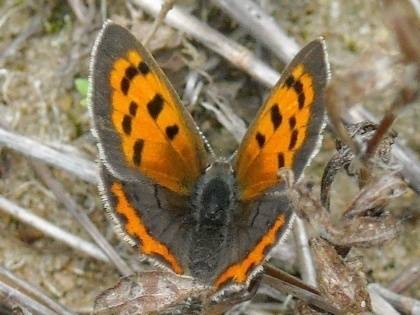 Surprised to see only the one Red Admiral - at about the same time last year at this location, there were hundreds. Overnight lows in the upper 30's. Slim pickings despite sunshine and warm-up into 70's. Lots of Liatris in flower. Not much nectaring on it yet. 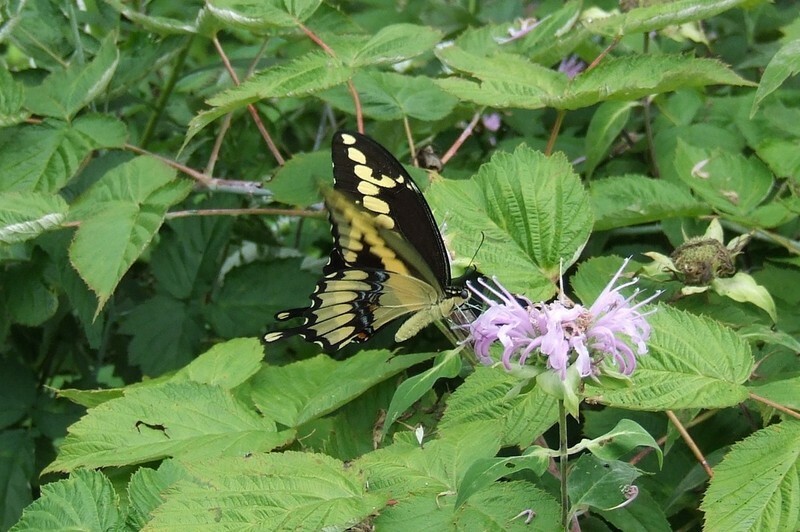 2 of the tiger swallowtails were seen elsewhere in Madison. It was getting late when I was out today. 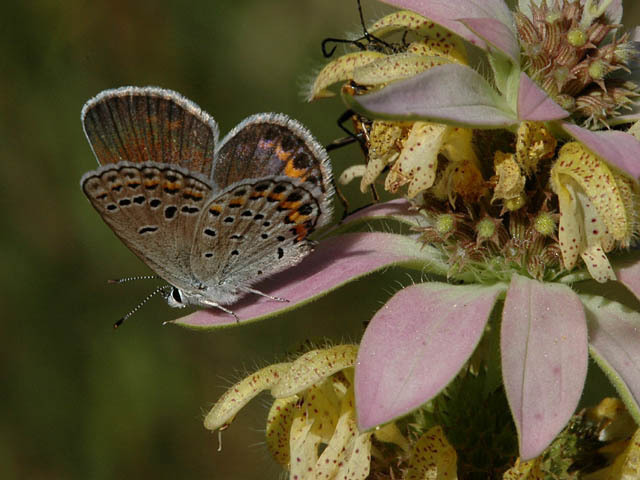 Mostly cloudy until about 4:00 and then the Karner Blues started perching and feeding on dotted horsemint, the first I had seen them nectar on this plant. 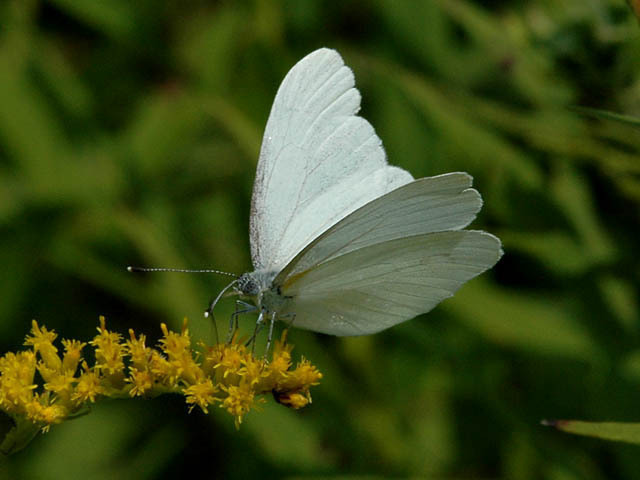 Butterflies drawn to newly installed butterfly garden. 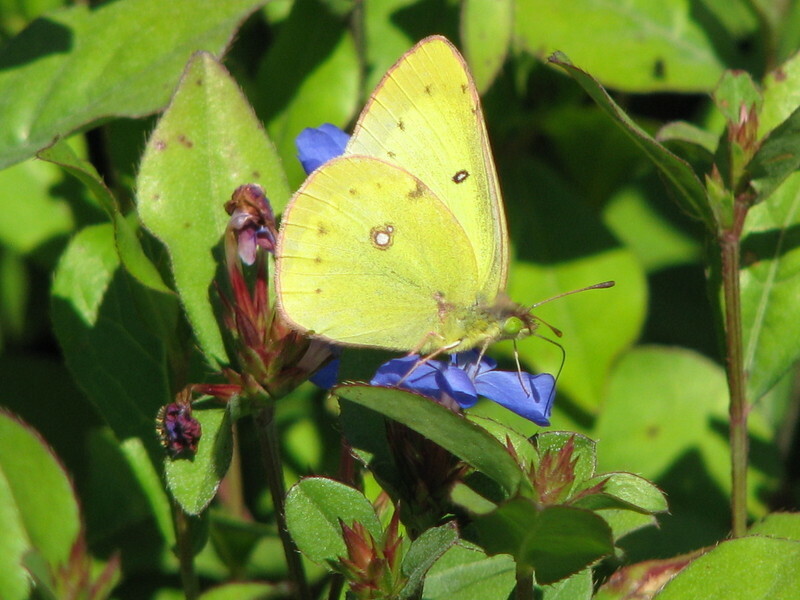 Lots of sulphurs but little else. 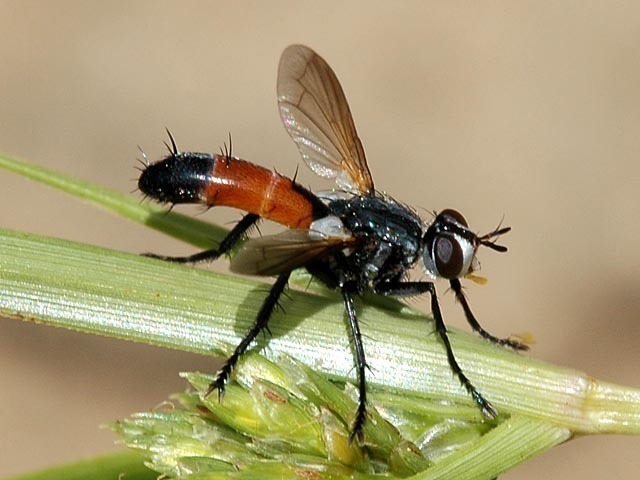 Photo is of a small fly I have never seen before. Same location as D. Hanson and D. Bratley on Aug 10. 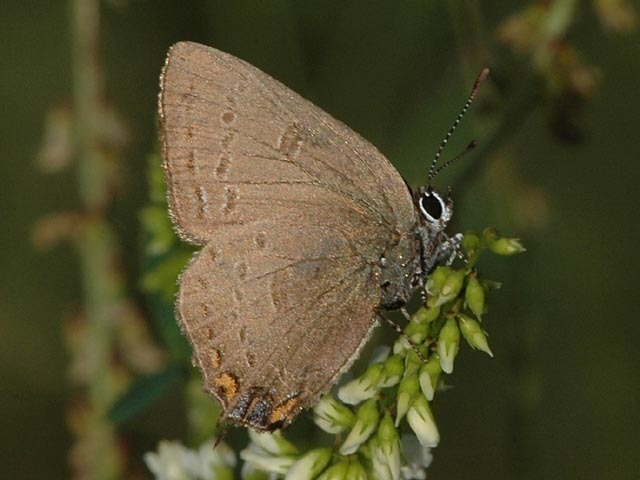 Little Wood-Satyr is late for the central part of the state. Location: Princes Point SWA near Hebron, off Frommader Rd. 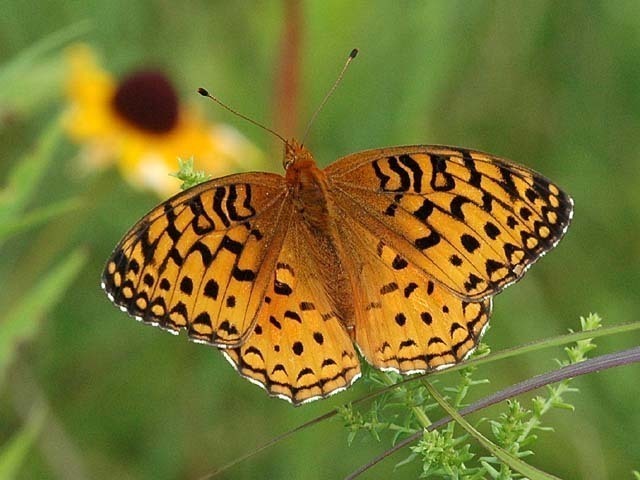 I was amazed this Great Spangled Fritillary could still fly. 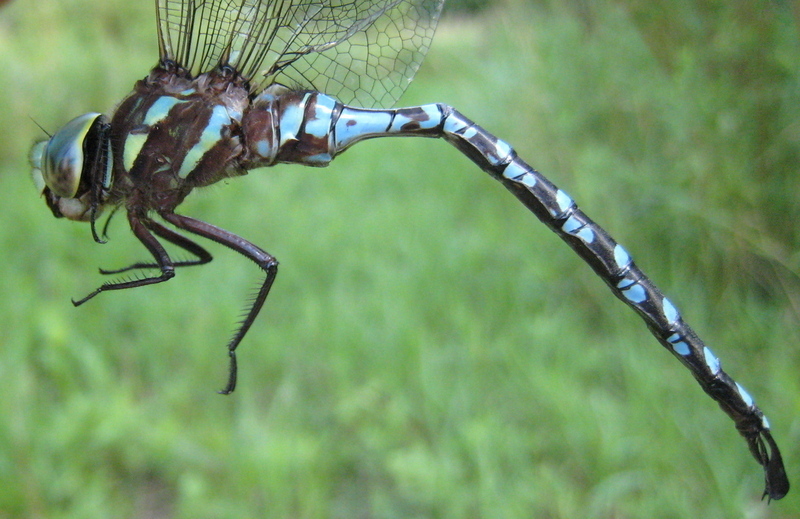 Also saw several Lance-tipped Darners. 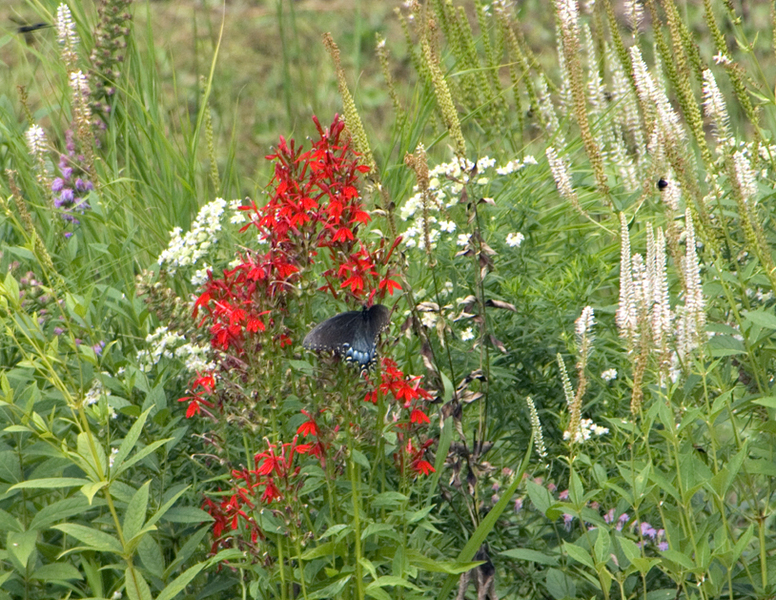 A fair amount of dwarf blazing star in bloom and rough blazing star was just starting. Also stopped by the Ice Age trail near Belleville...plenty of ripe blackberries (really good!) and mosquitoes (really bad! 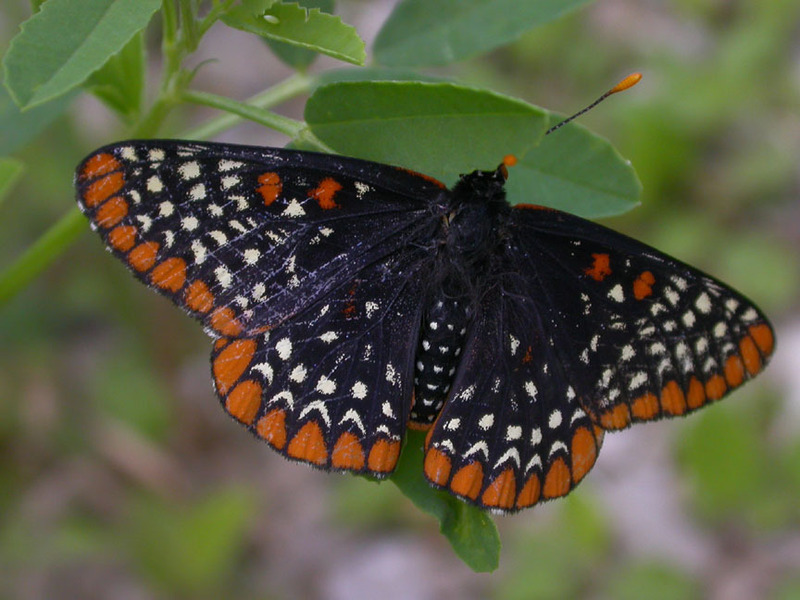 ), but not so many butterflies. Just stayed around the parking lot on the south end. 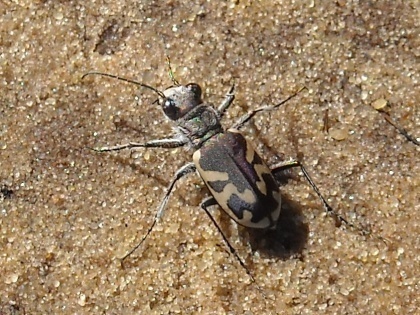 Went out in search of tiger beetles on some of the sandy beaches in Door County. 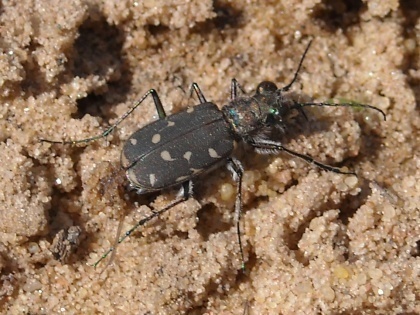 Found four species out and about Cicindela punctulata, C.repanda. 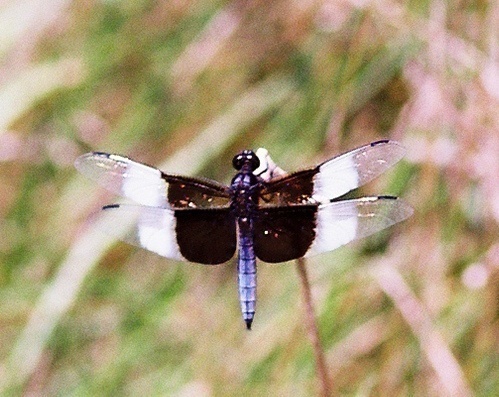 C.hirticollis rhodensis and C. doudecimguttata. The rhodensis where common and found with complete maculations to no markings. Also Stictoleptura canadensis (a black and red longhorn)a real nice surprise. 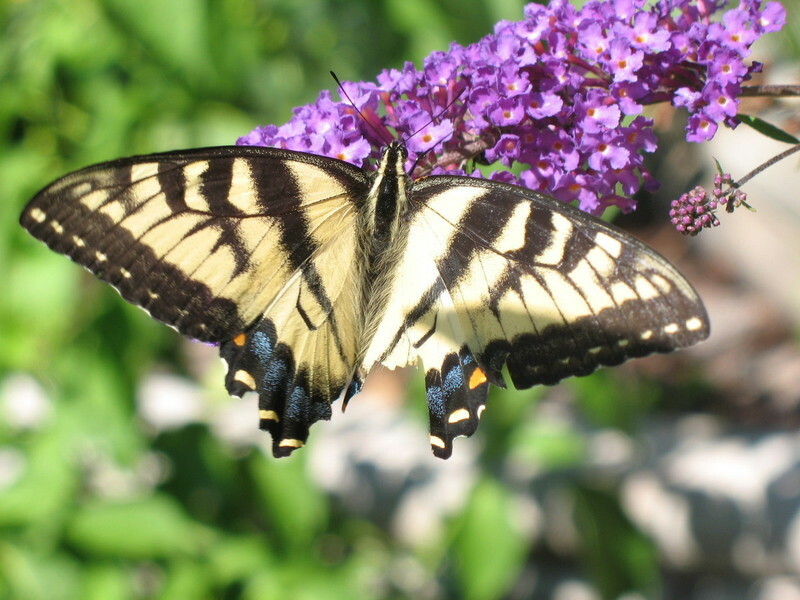 I captured this picture of a Giant Swallowtail on my butterfly bush in my backyard. It was a beautiful sunny afternoon treat. 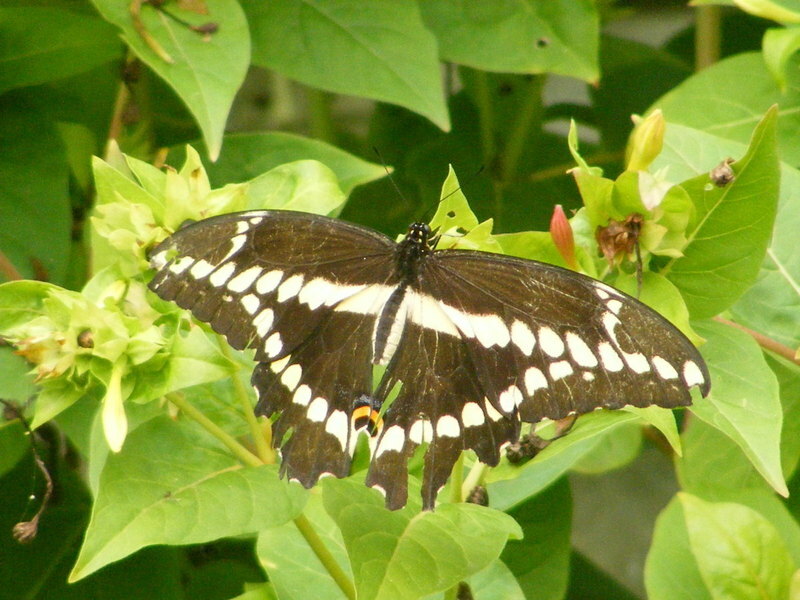 I get a lot of attention from different butterflies on that bush but this is the first time I've been visited by a swallowtail. Found the Hackberry sitting on the hood of my car waiting for me when I got back to the parking lot. Location: Emmons Creek Iceage Trail. Hartman segment. 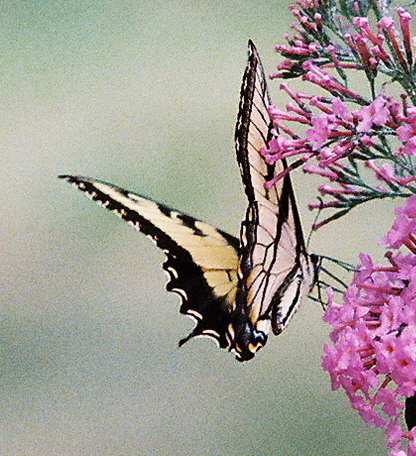 Nice area, Two swallowtails ,the female was black, neither would pose for a picture. 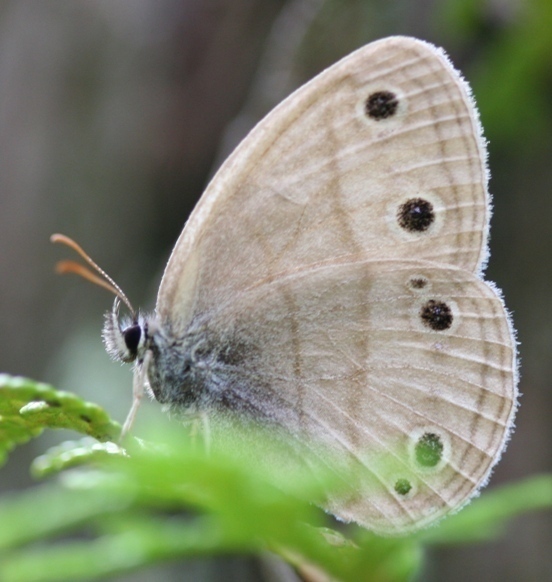 Butterfly numbers way down. 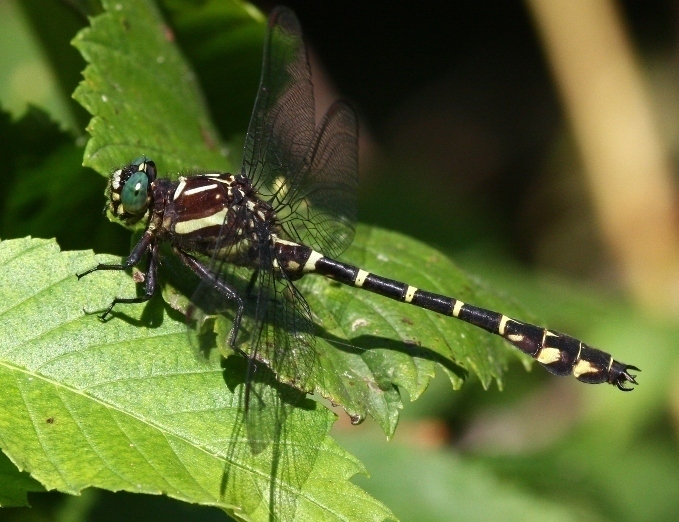 Had a nice Zebra Clubtail though. 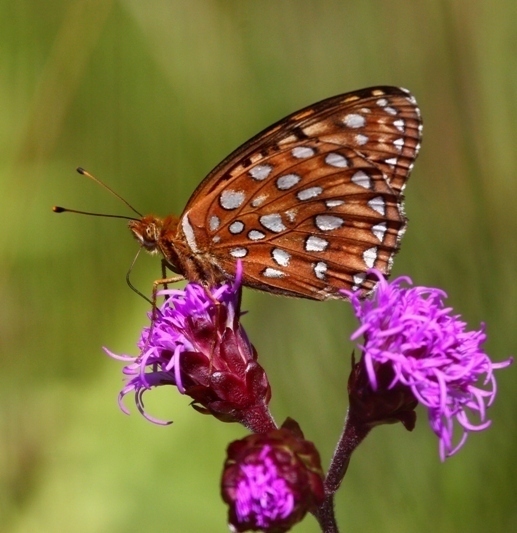 Lots of blazing star but little nectaring on it. 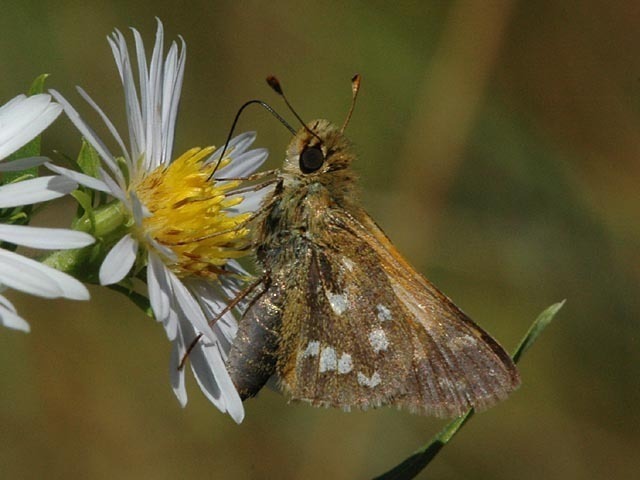 The only Leonard's Skipper I saw was on the ground. 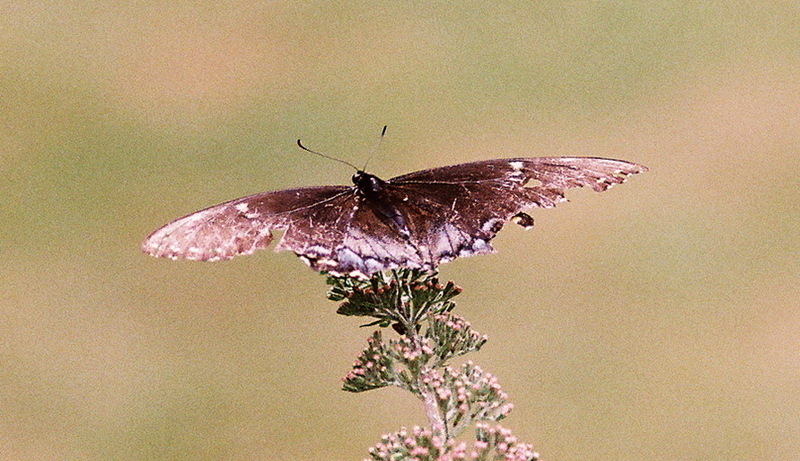 The Northern Broken-Dash was fairly fresh. 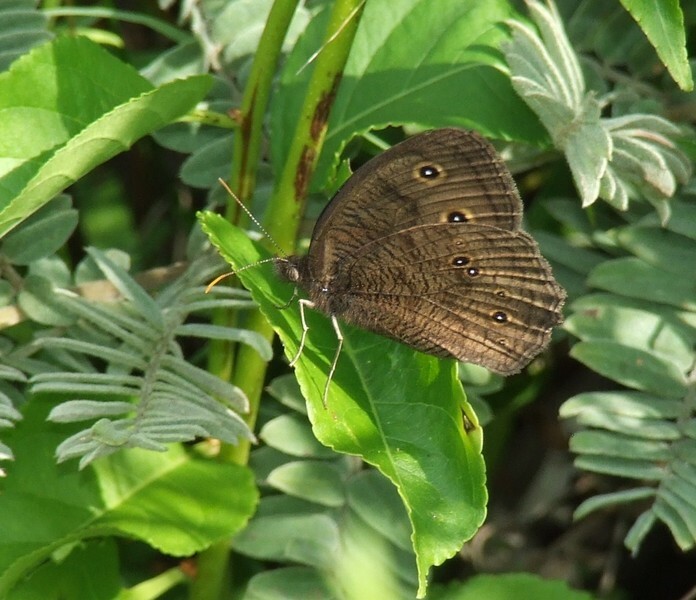 Also saw a Julia, an escapee from the captive butterfly event at Olbrich this summer. 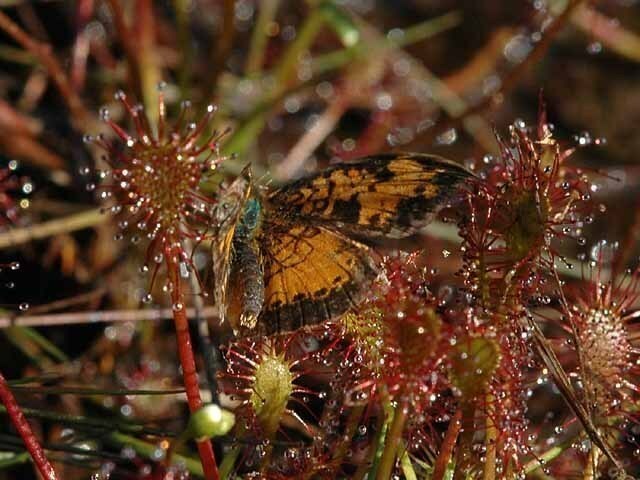 The photos are of butterflies and odes caught in spoon-leaf sundews. 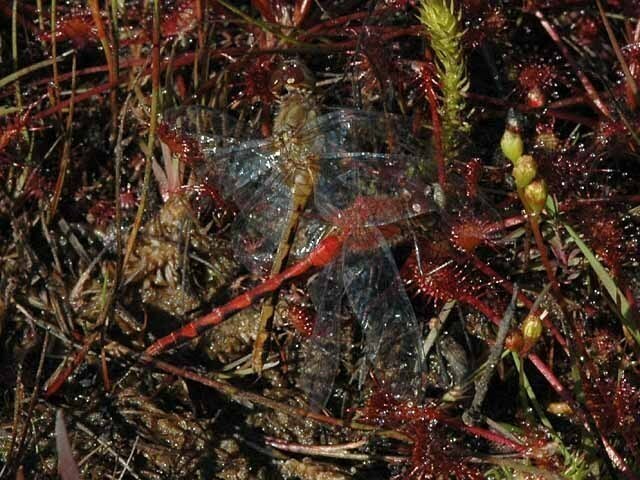 Those sundews are real predators! 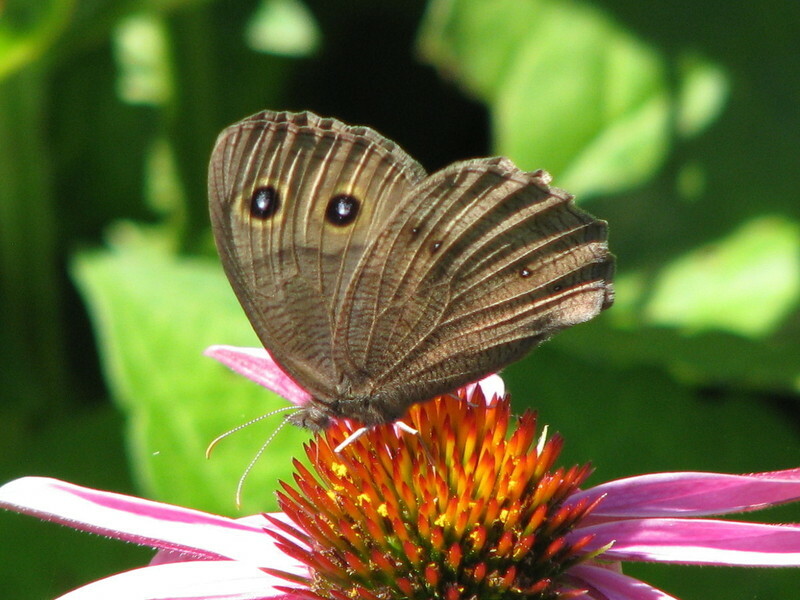 The butterflies were attracted to my garden plot near Oregon. 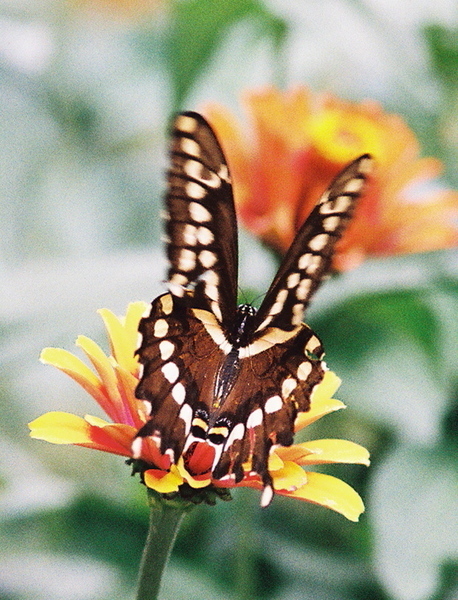 They especially like the zinnias. 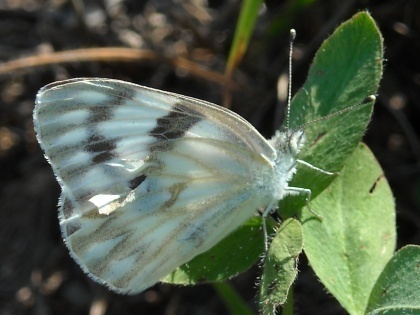 First Mustard White that I have seen in August. 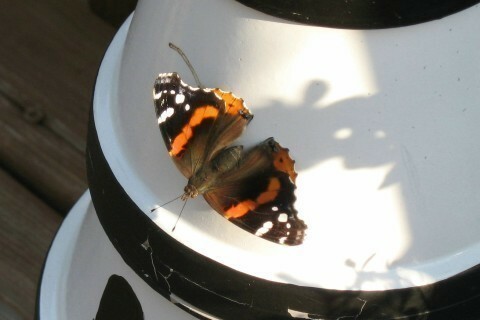 I found this Red Admiral on my deck attached to my solar lighthouse that I made out of flower pots. It was very still so I was able to get close for a photo. 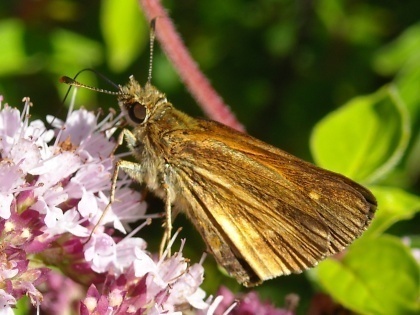 Finally the Leonard's Skippers are out at SGP! The rough blazing star is just barely starting to bloom. 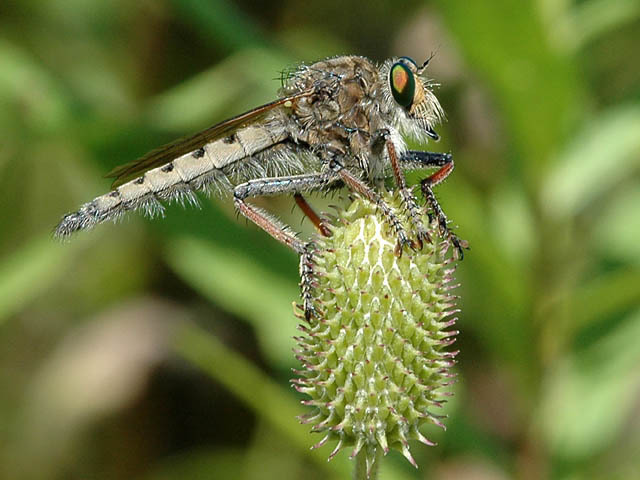 The robberflies were busy: saw one who had caught a huge grasshopper and another with a bumblebee breakfast. 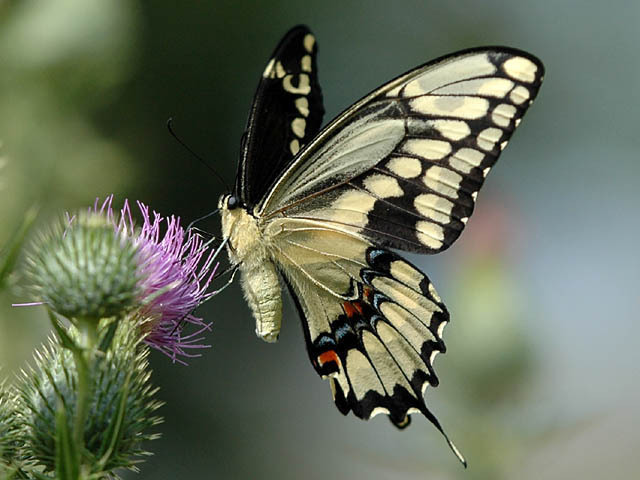 The swallowtails and fritillary really liked the thistle flowers and it was fun to get in close and observe their feeding. 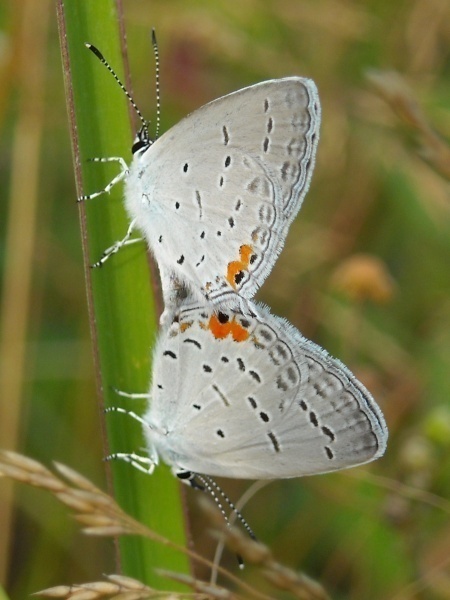 Karner Blues are still fairly fresh. 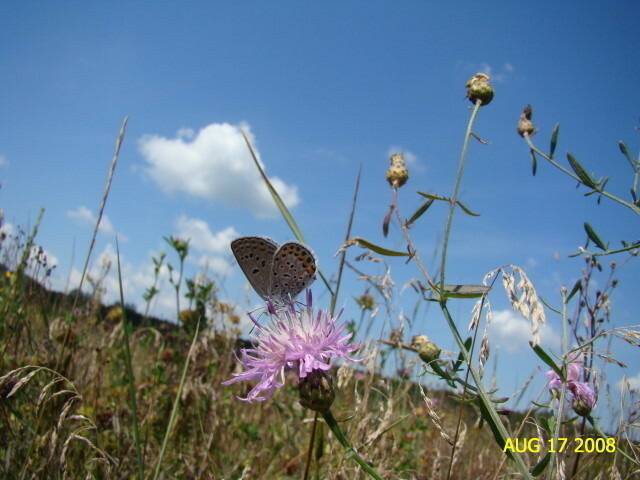 Lots of thistle and joe-pye and other blossoms, but surprisingly little butterfly activity -- maybe it wasn't sunny enough? 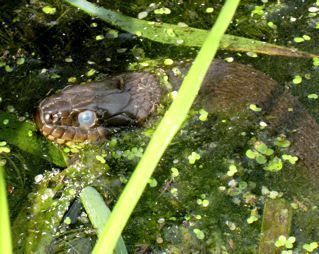 The water snake was a fun find ? 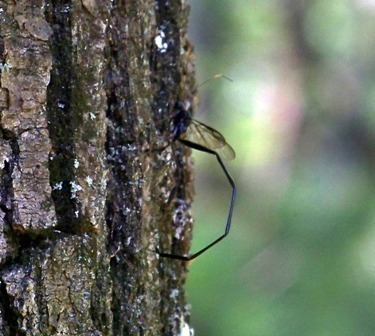 if you look closely, you can see an engorged mosquito on its head. 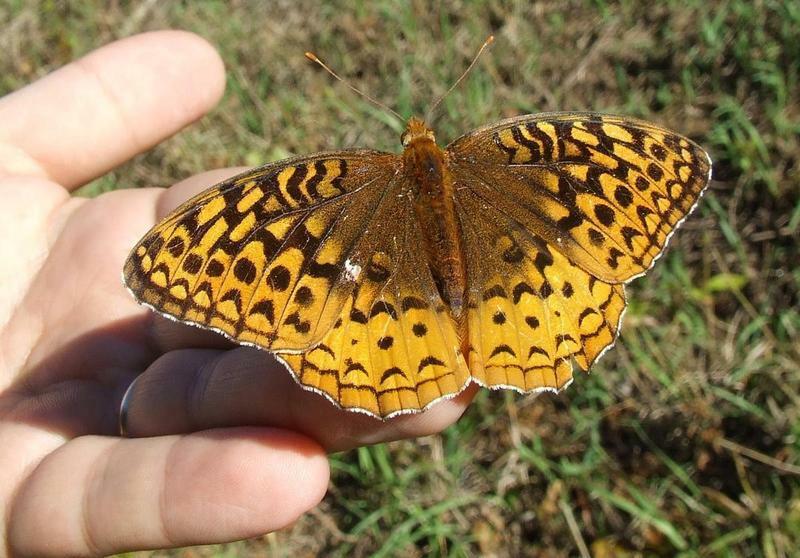 We reported one earlier this summer. It was new to us. It's (could be more than one) back now for the last week or so. 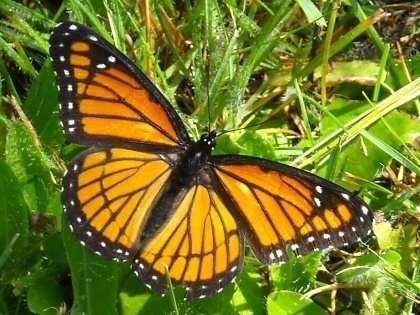 These were all seen in my yard today. 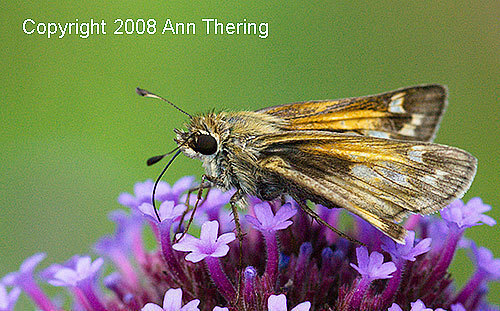 There were also several dark skippers that didn't cooperate for identification. 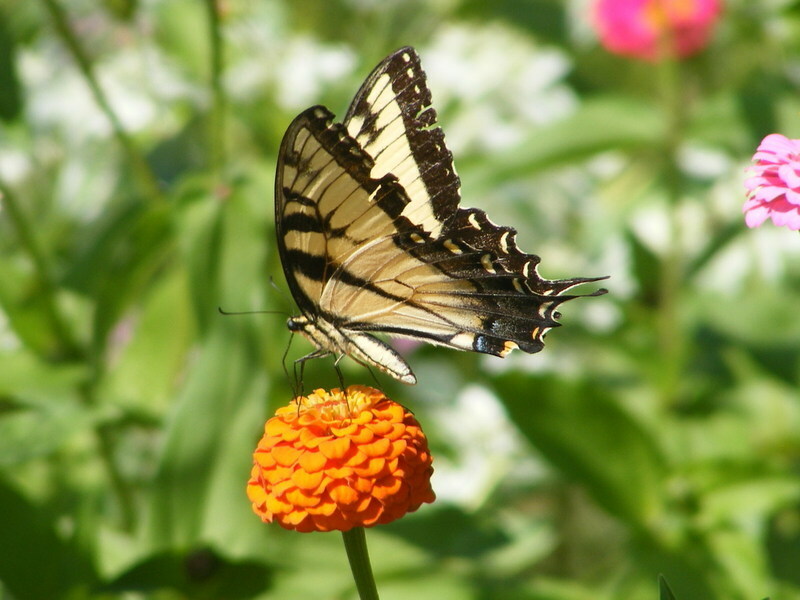 I caught this Giant Swallowtail visiting my home garden. 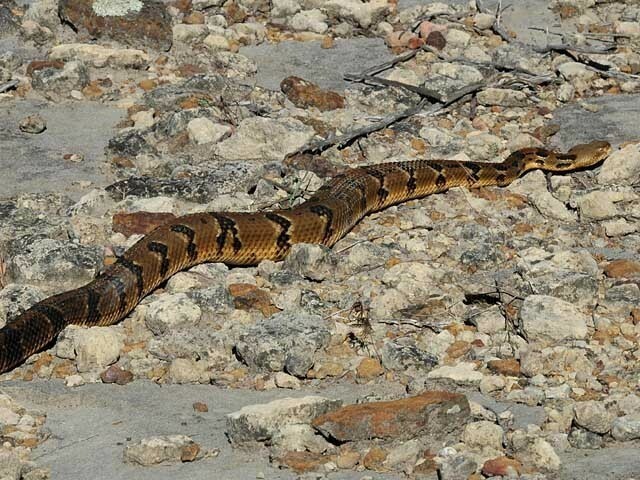 We rarely see these guys in my neck of the woods! 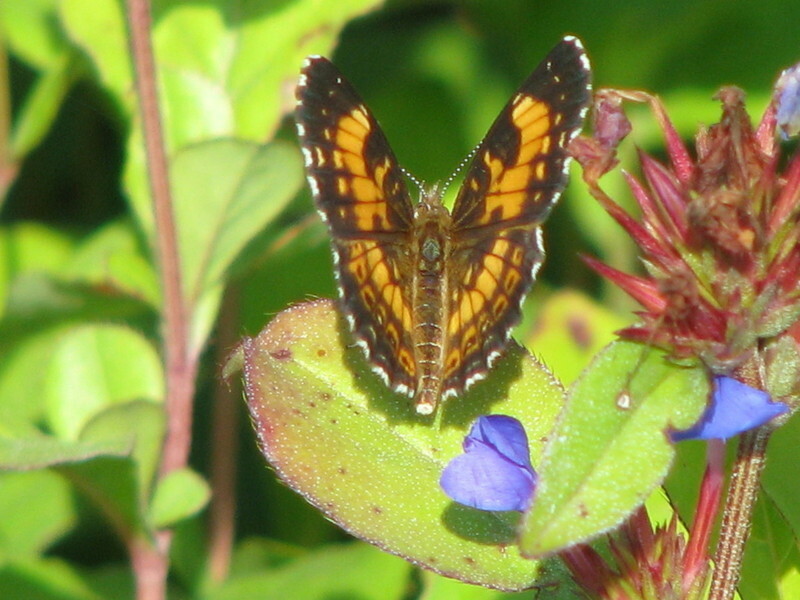 This Eastern Tiger Swallowtail visited my home garden. 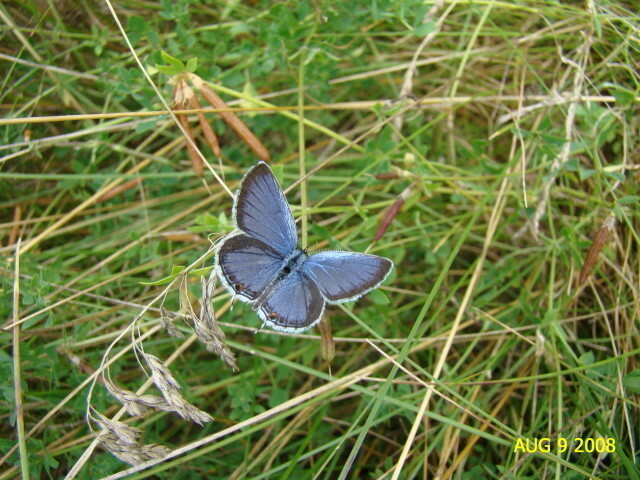 I have seen both males and females this summer. 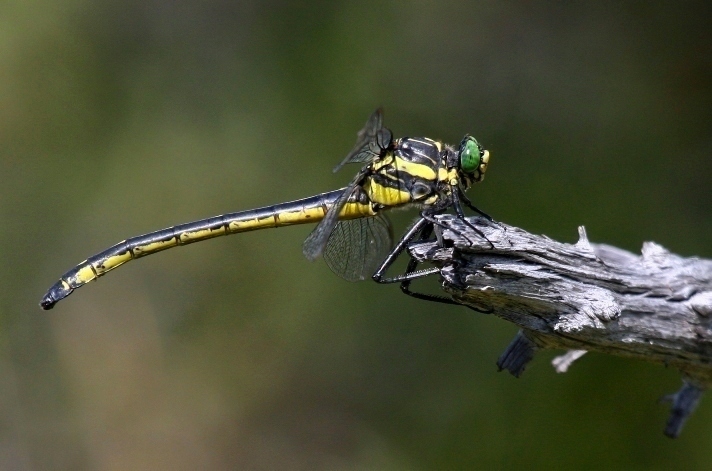 The real excitement was two different swarms of 25+ Green Darners in flight over the goldenrod meadows. 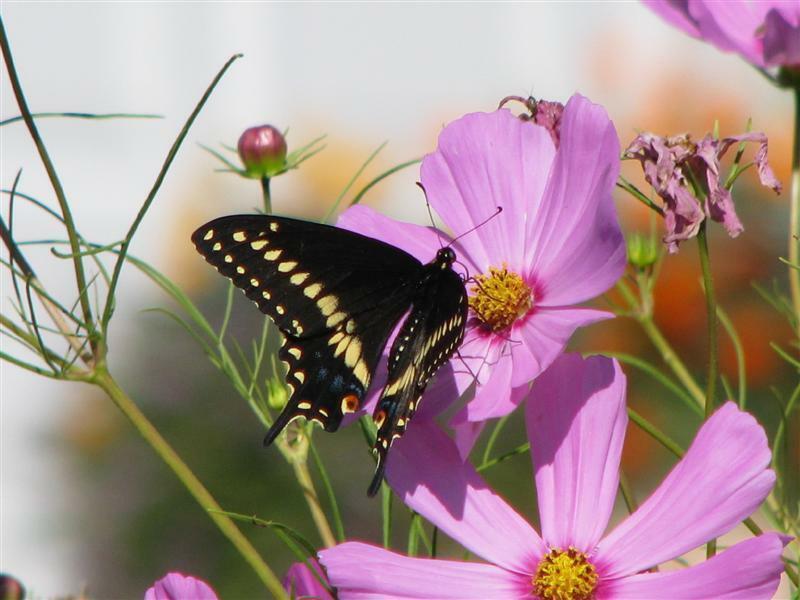 This is a female Eastern Tiger Swallowtail that was enjoying the purple cone flower in my backyard. 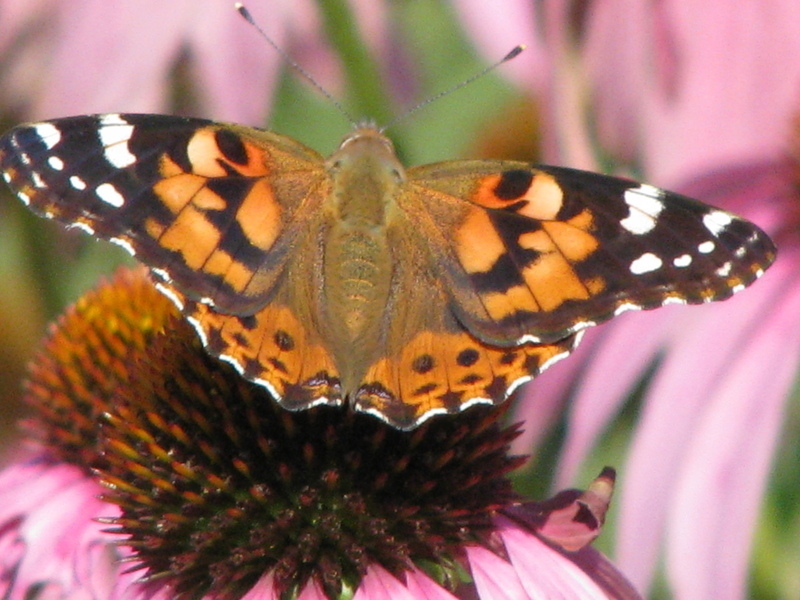 I saw it fluttering around and ran outside with my camera in time to get this close up. 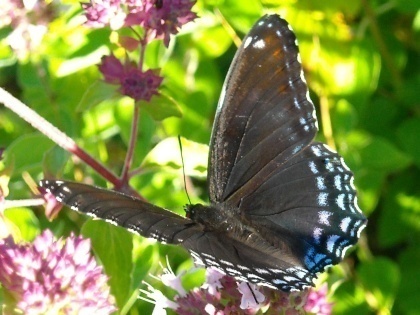 The Giant Swallowtail was on Phlox in our garden. This is the first time I have seen this species here. 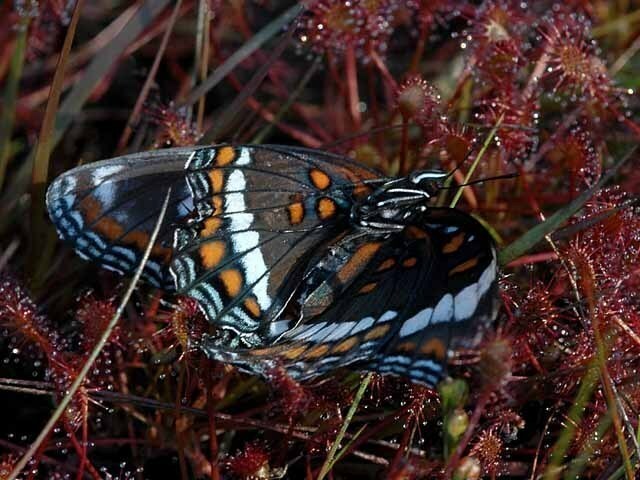 Beautiful swallowtail and monarch in perfect condition. 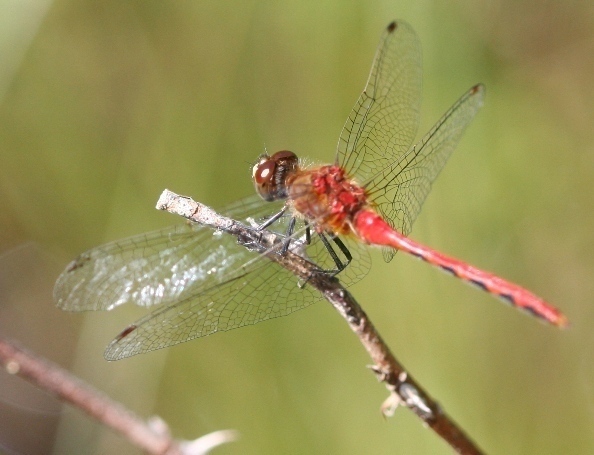 There were also many dragonflies and damselflies around the lagoon area. 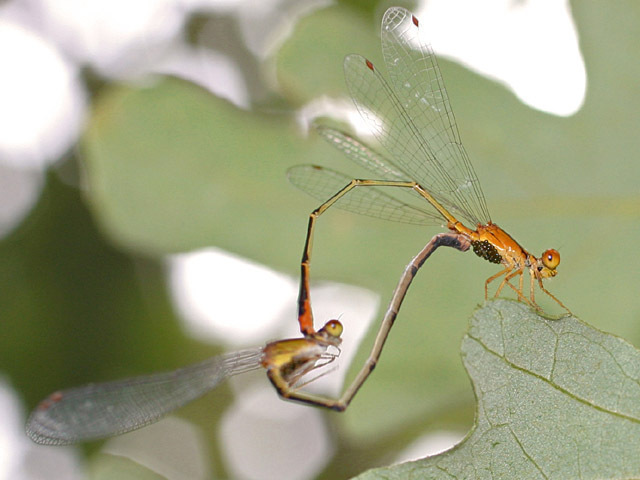 Though the light wasn't good, I took a photo of a damselfly mating wheel. 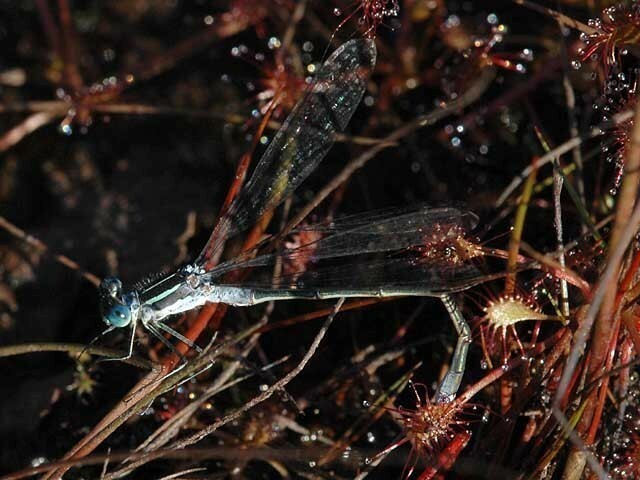 While the photo isn't at all artistic, I was astounded to find all the mites on the male Orange Bluet. 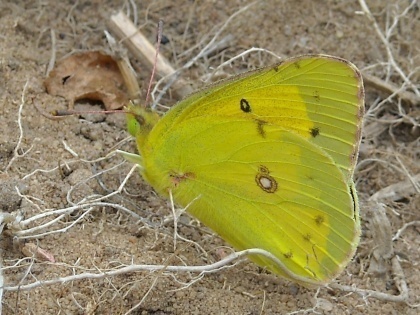 Little Yellows found at the two western sites. Sighted while eating brunch - didn't have time to check what else may have been using the gardens here. 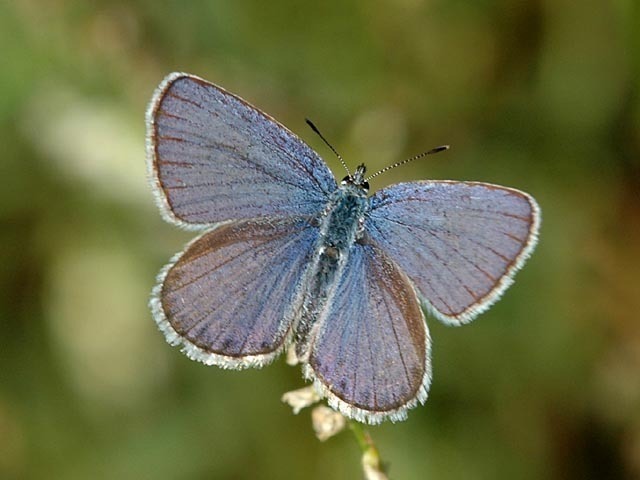 These sightings are within the last 7-10 days, the oldest being the Eastern Tailed Blue.The Clouded Sulphurs were a mated pair. 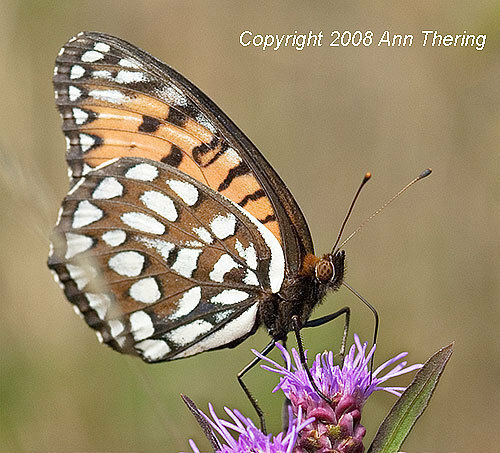 The female Eastern Tiger is a bit worn, but still nice to look at. 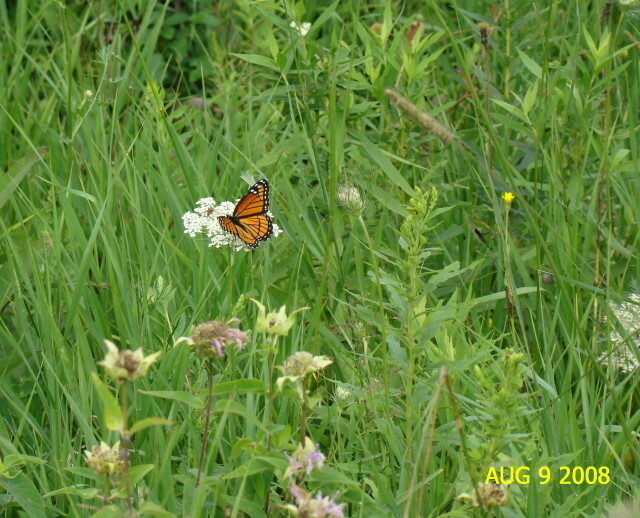 The Monarchs I spotted in four pairs cruising separate territories in a large meadow. 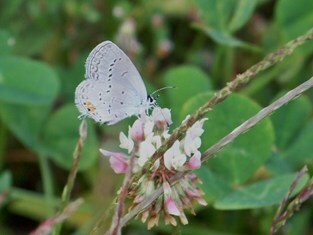 A couple of pics from my yard. 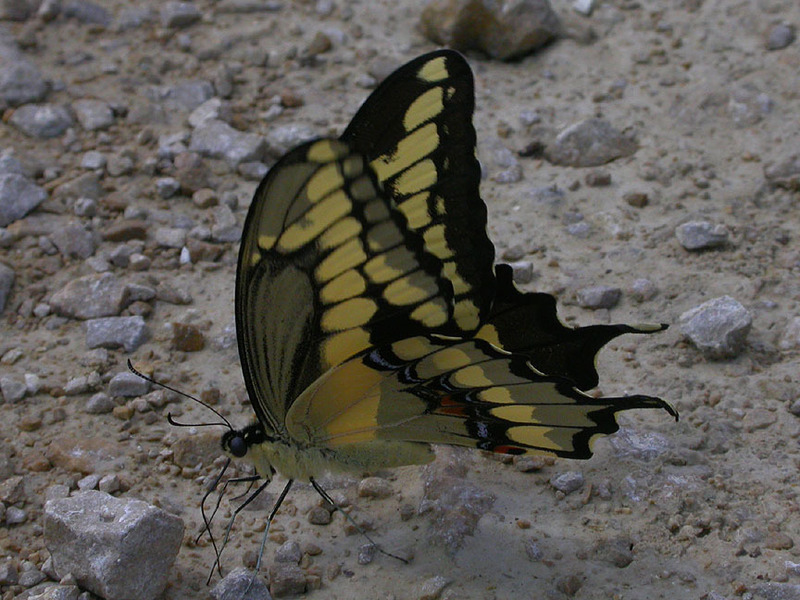 The swallowtails are looking a bit worn. 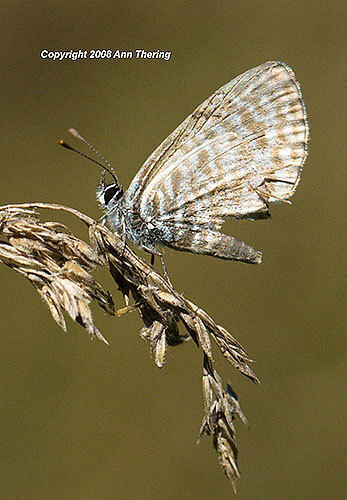 Butterflies noted while playing golf. 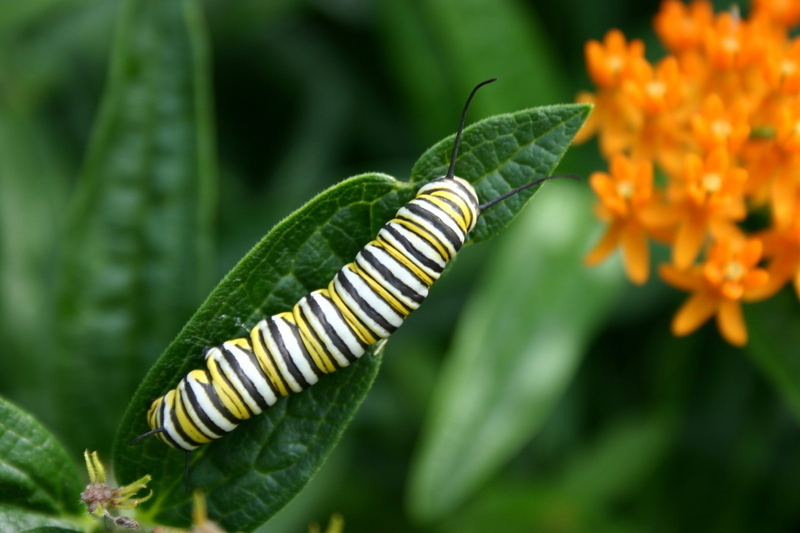 Just a neat picture of a Monarch caterpillar. 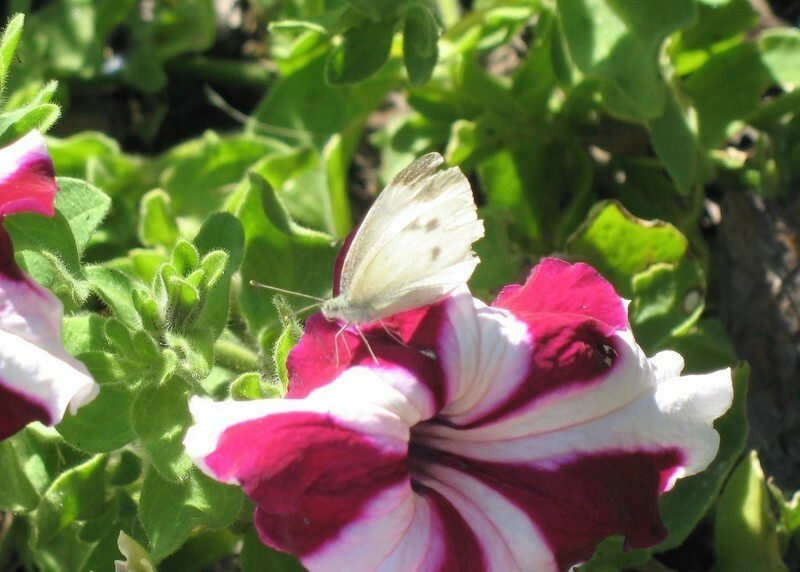 I found this white butterfly on my petunias in my backyard. 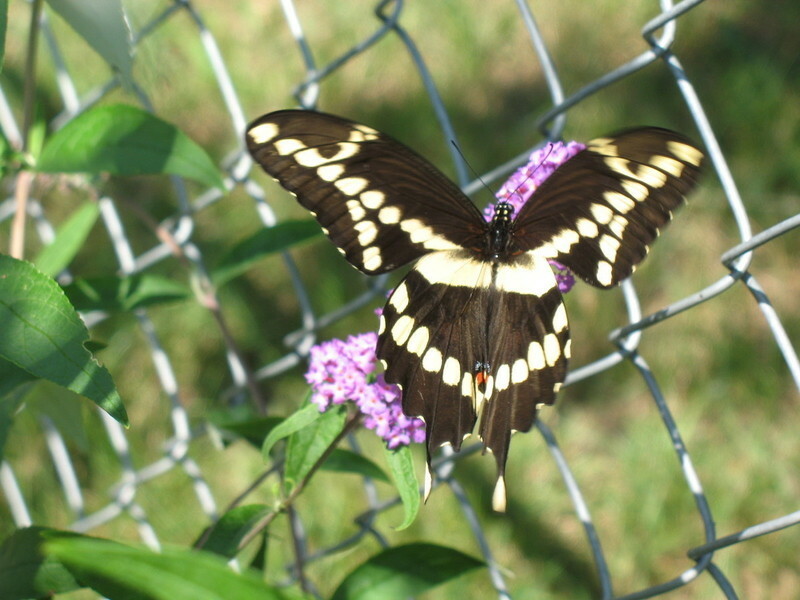 Here is an Eastern Tiger Swallowtail that visited us today. 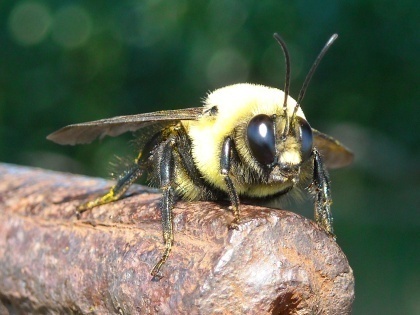 This one looks like it is missing the tail. 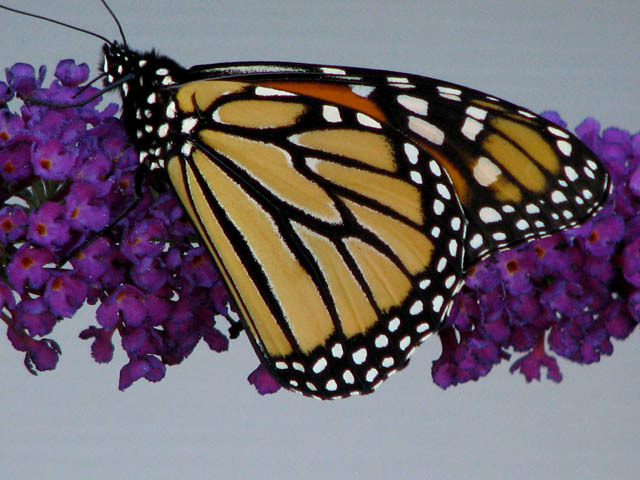 It was on my butterfly bush. 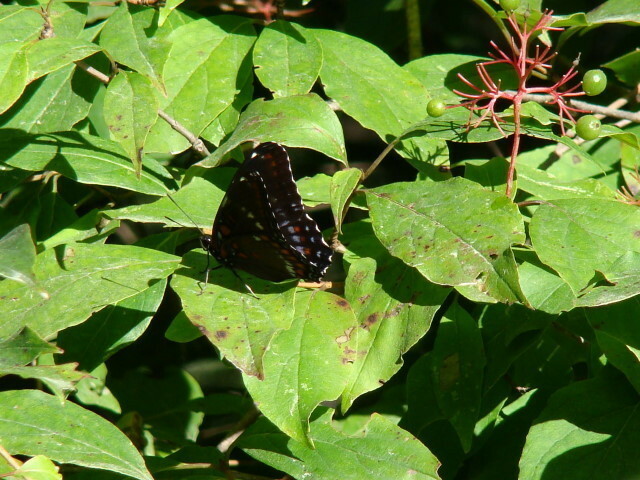 I can't believe all of the butterflies that come to that bush! 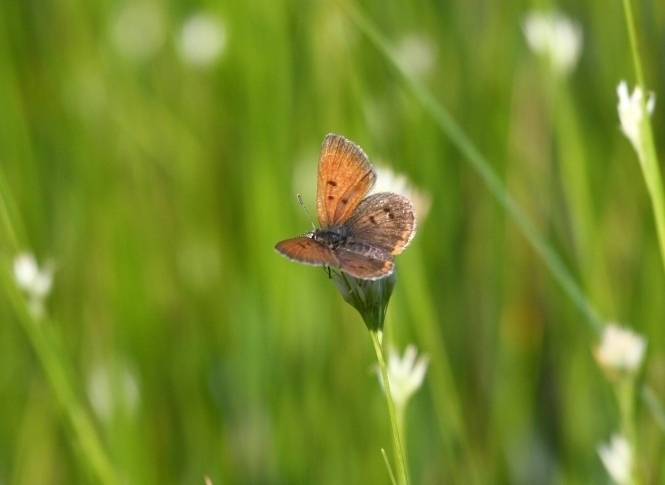 Late Bog Copper. 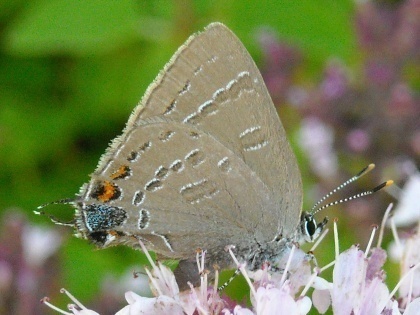 Also had a possible dark Arctic sp. 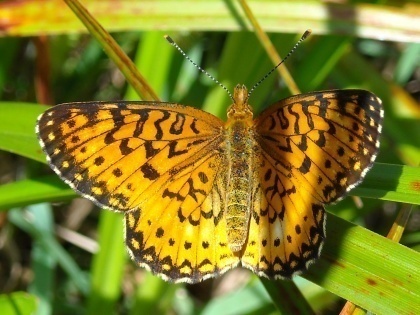 and two Fritillary sp. that never stopped flying. 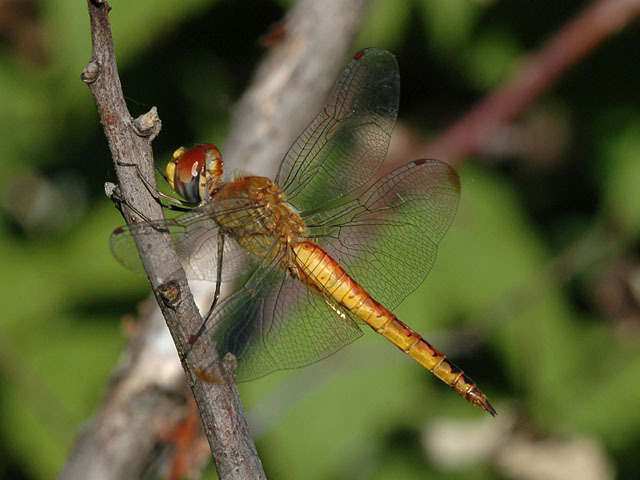 Major highlight, though, was several SUBARCTIC DARNERS! A partial list. 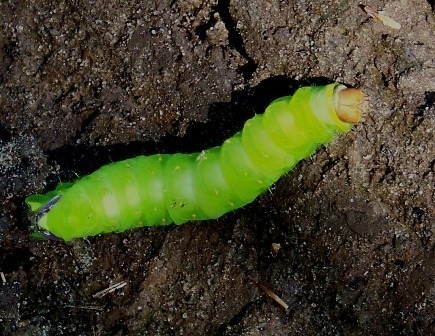 Other insect highlights at Wildcat Flowage BRSF included a huge underwing moth, an American Pelecinid wasp, and a large (3 inch) moth caterpillar which was crossing the road. Location: Tie Mill Rd. 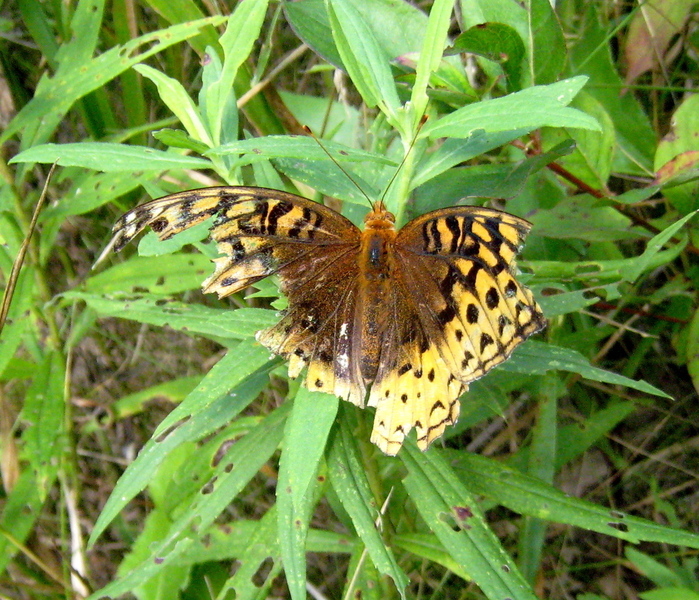 area and Brule River SNA. 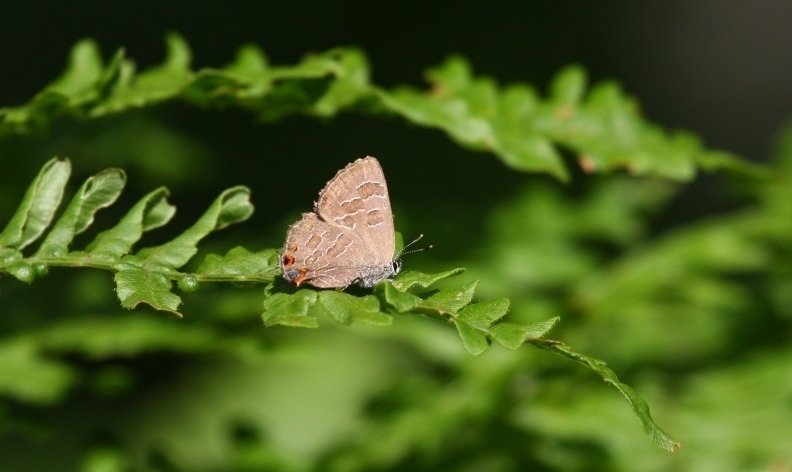 Surprised to see the Coral Hairstreak, Summer Azure, and Common Branded Skippers. 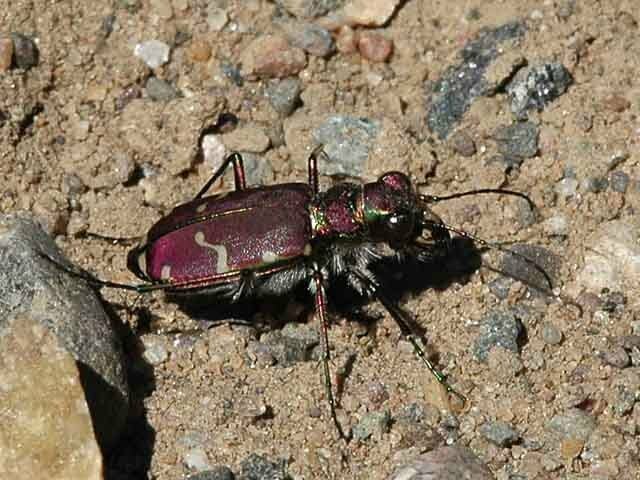 Also saw several Cicindela limbalis. 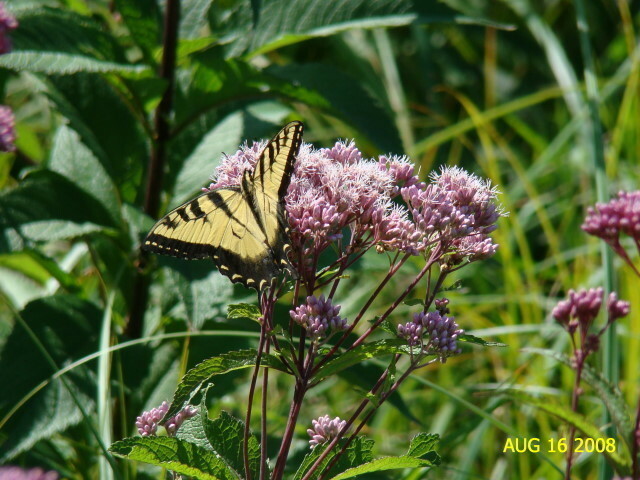 We have been fortunate this summer in that we have had the, almost, continuous company of Monarchs, Eastern Tiger Swallowtails, Giant Swallowtails, Black Swallowtails and White Sulfers, for the last 3-4 weeks. 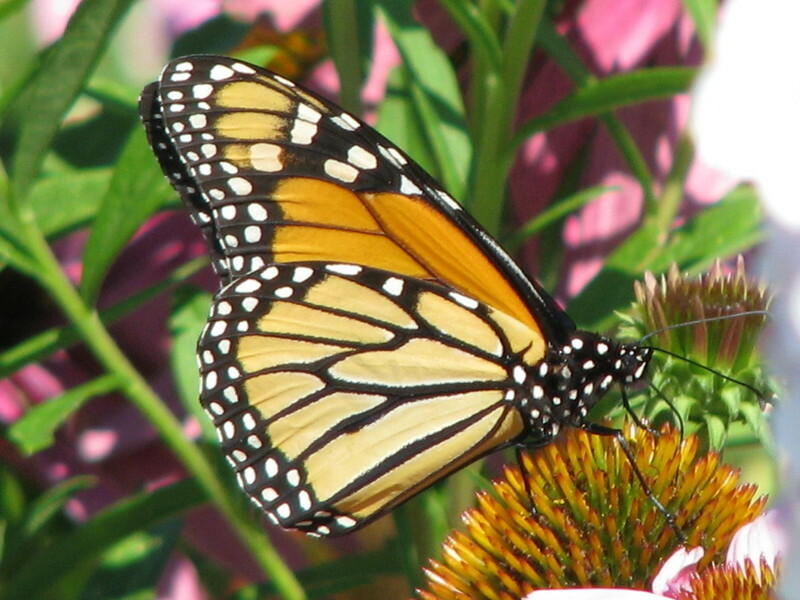 Guess it helps to have three different kinds on milkweed, butterfly bushs, dill, Queen Ann's lace, etc. in your garden. What a difference from last year when we were just installing these plants at our new home. 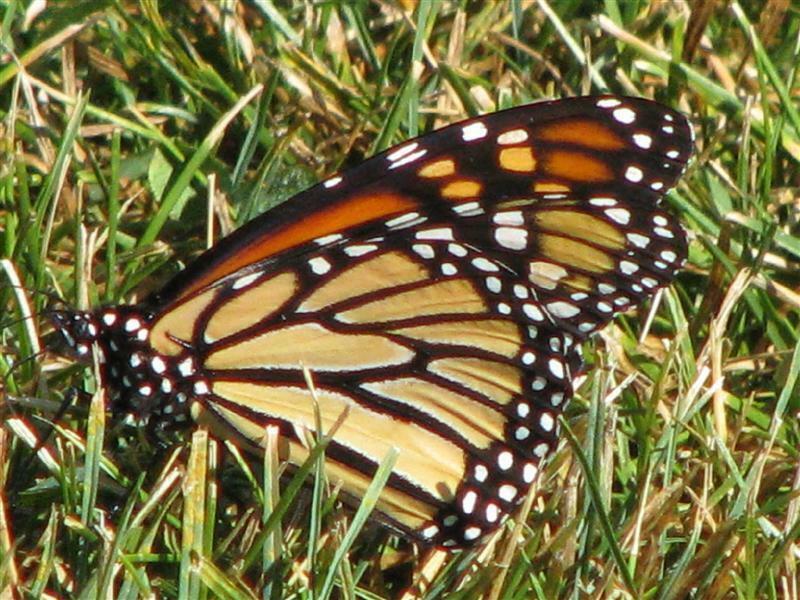 The Monarchs and the Black Swallowtail enjoyed the lawn as I was watering the grass...they stayed around until I turned the sprinkler off. 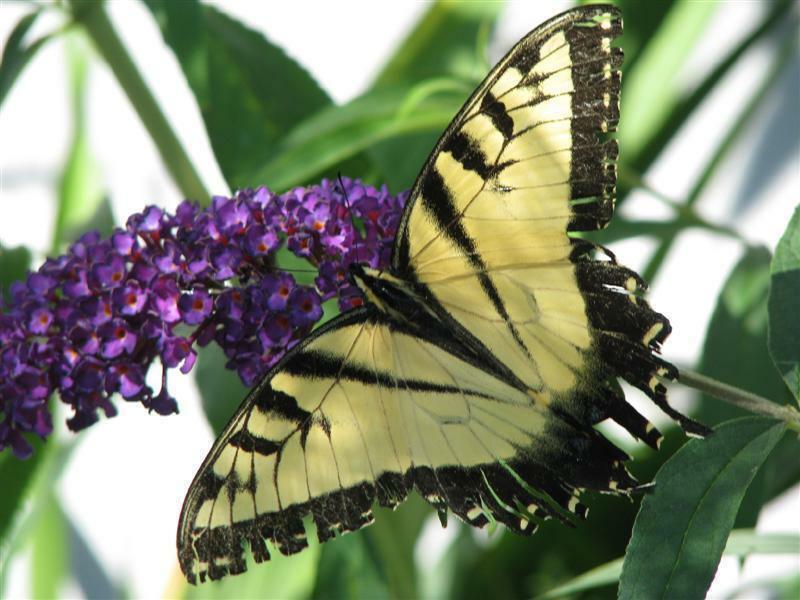 The Eastern Tiger Swallowtail was very fast moving on the butterfly bush...he kept turning and moving from flower to flower..please notice all the rips on the butterfly. This location is a large grassy city park with a lagoon. 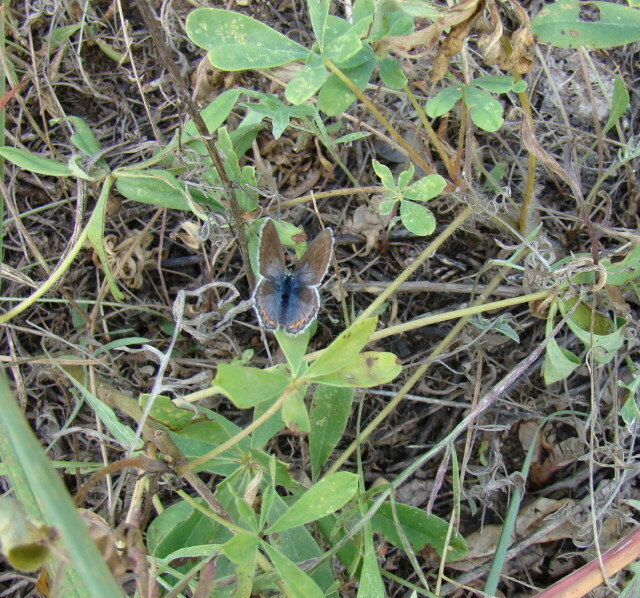 Many small skippers, sulphurs and eastern tailed blues are usually present. 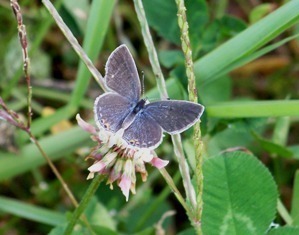 Got a nice photo of an eastern tailed blue mating pair and widow skimmer. 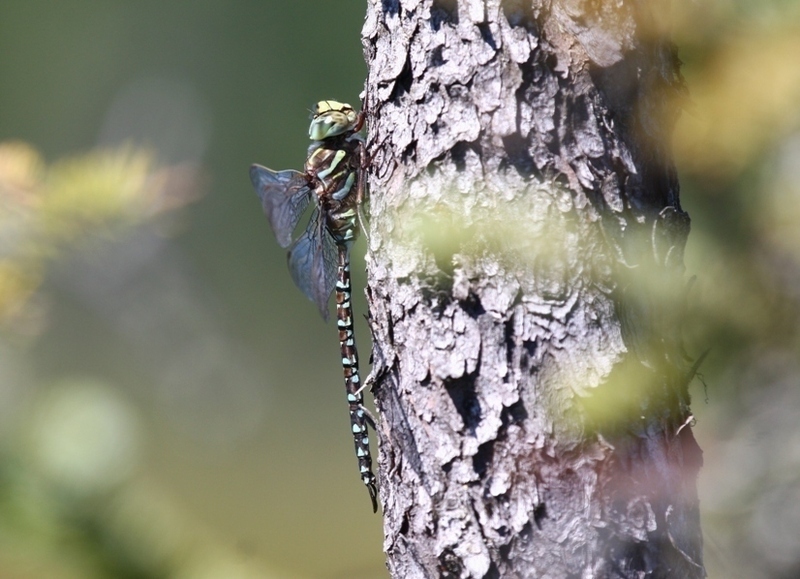 Dragonfly population seems to be dropping off a bit though I spotted several mating pair of dragonflies and damselflies within the last few days. 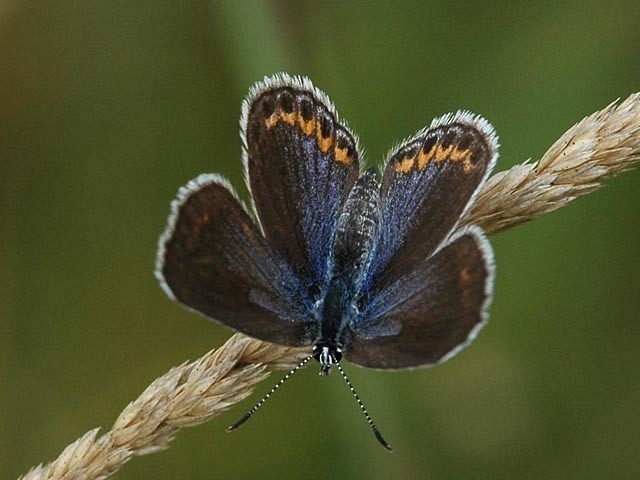 Lots of blue dashers are still present. 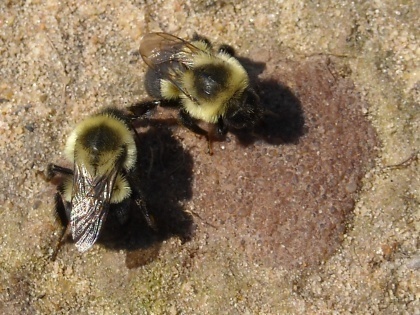 The 2 bees that I photographed were moving around on a small sandstone as if they were puddling on it. The stone and the surrounding sand were dry and there was nothing obvious on the stone. I've never observed this type of behavior before.